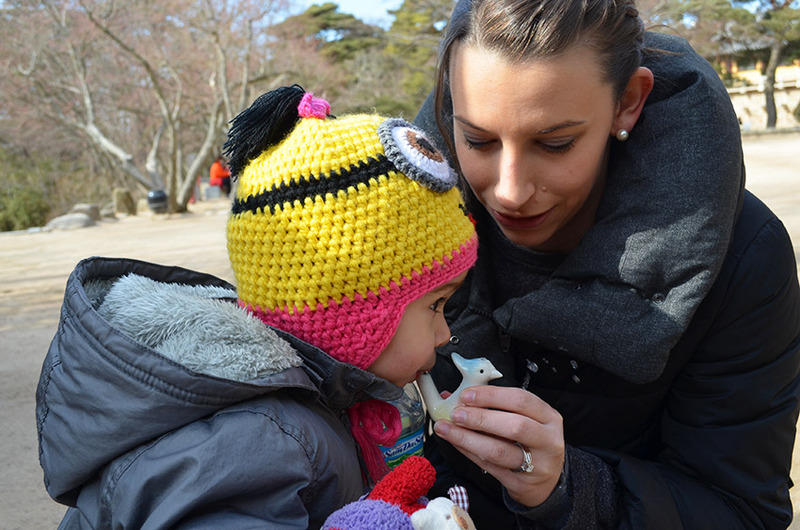 With the recent busyness of my graduate schoolwork, position change, and adjusting to life as a family of three, it’s been some time since we traveled outside of Korea. 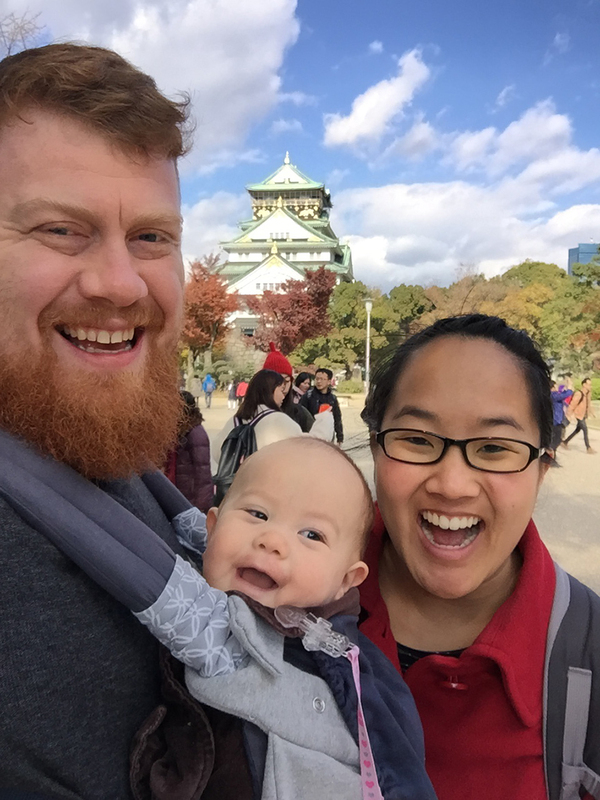 During our recent Thanksgiving break, we had a long weekend and decided to check out nearby Osaka, Japan. We left for the airport right after school and flew on Peach Airlines, a knee jammed, but efficient discount carrier from Incheon (ICN) to Kansai International Airport (KIX). Peach offers great prices for airline tickets across Asia, but charges for the extras (meals, checked luggage, seat preference, etc.). If flying Peach, it’s worth noting you need to print your ticket QR code ahead of time or face the unexpected Ryan-Air –ish fees. On Friday, we stopped by Nippombashi and Namba stations to try and find the tourist friendly Kansai One Cards, but they were sold out. 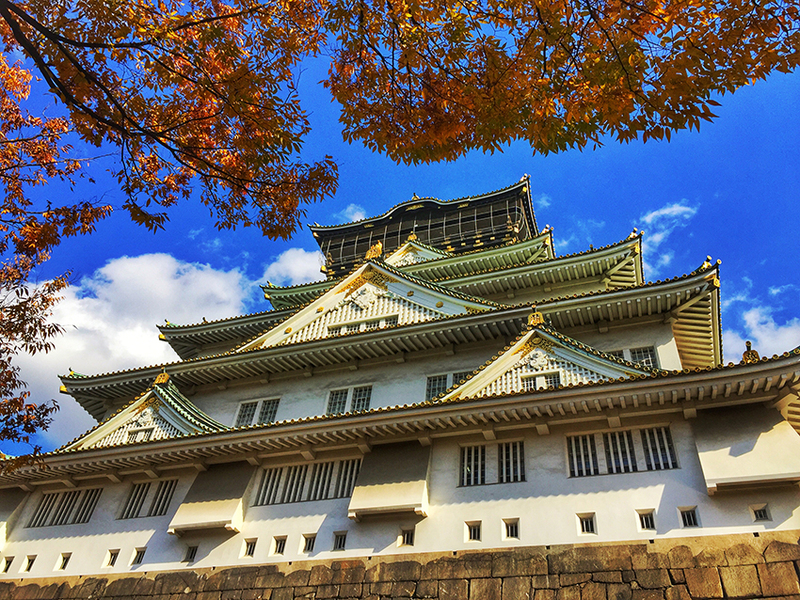 Instead, we purchased ICOCA transit cards and made our way to Osaka Castle. We enjoyed exploring the castle and its grounds. Aside from the crowded inside and top of the central castle building, the grounds were quiet. 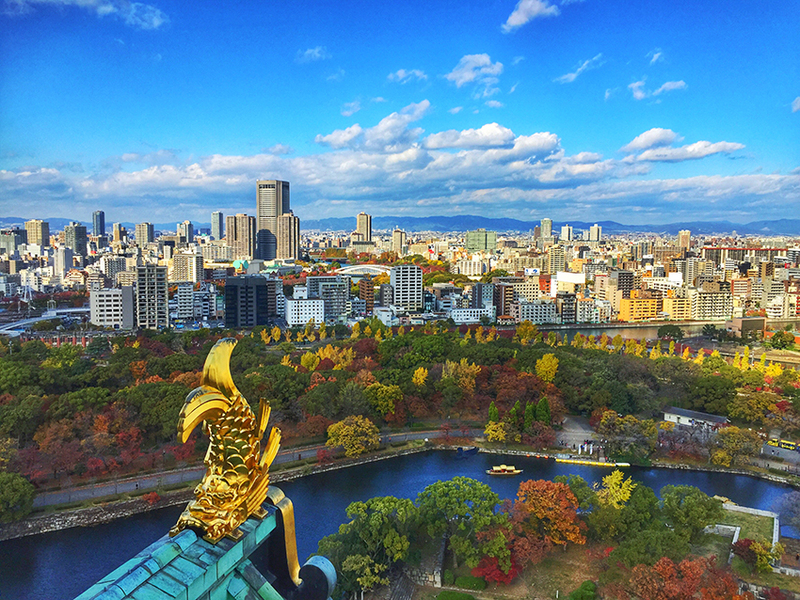 The top story of the central castle building had a great view of the city and surrounding mountains. The outside of the building is beautiful, accented by gold and surrounded by maple trees. 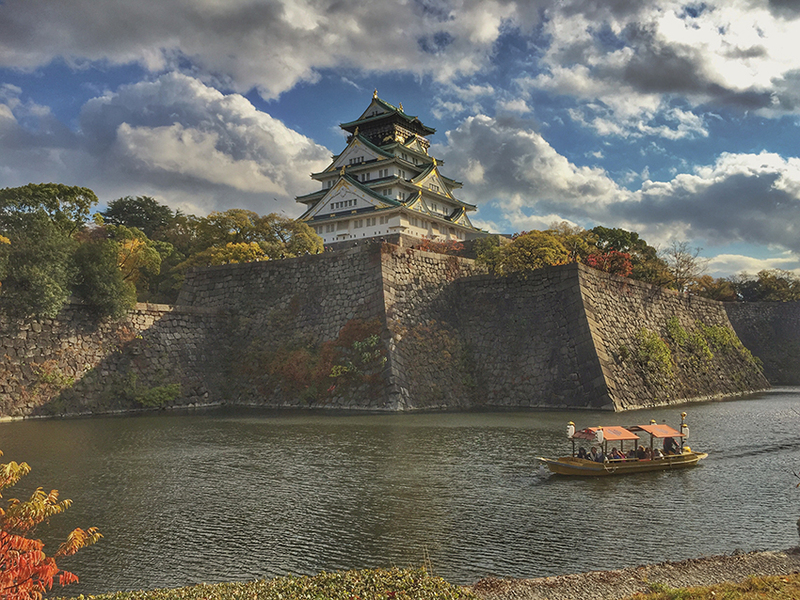 We took a couple of hours walking around the castle walls and giant moats. There’s an option to take one of these traditional looking boats through the moat, but we decided to take in the view from land. Later on Friday, we headed towards the Dotonbori area. This part of Osaka is super crowded as it a hot spot for tourists, shopping, and food. There are several iconic and unique signs on the outside of stores and restaurants. 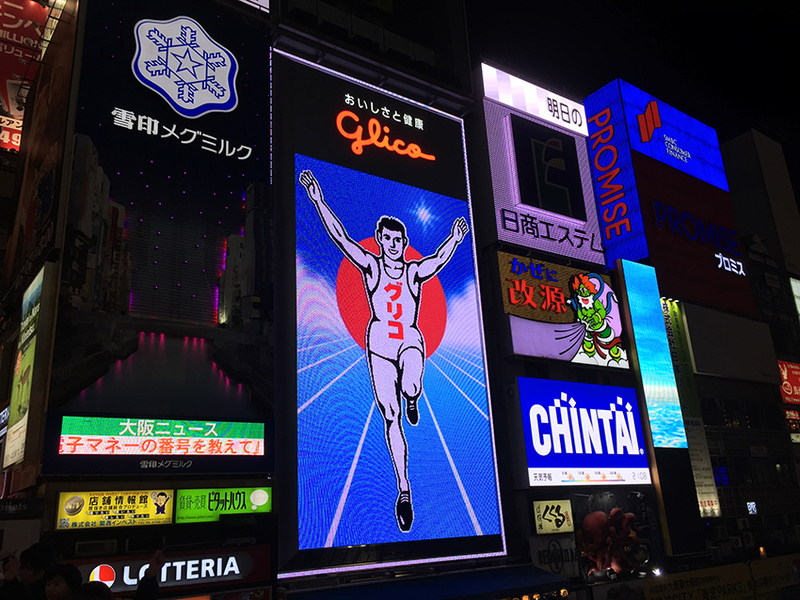 One of the most recognizable signs is the Glico Running Man by the Ezaki Glico confectionary. According to Rough Guides, the sign is over 70 years old and the area around the sign is a popular gathering spot following sporting victories. We slurped Ramen for dinner. 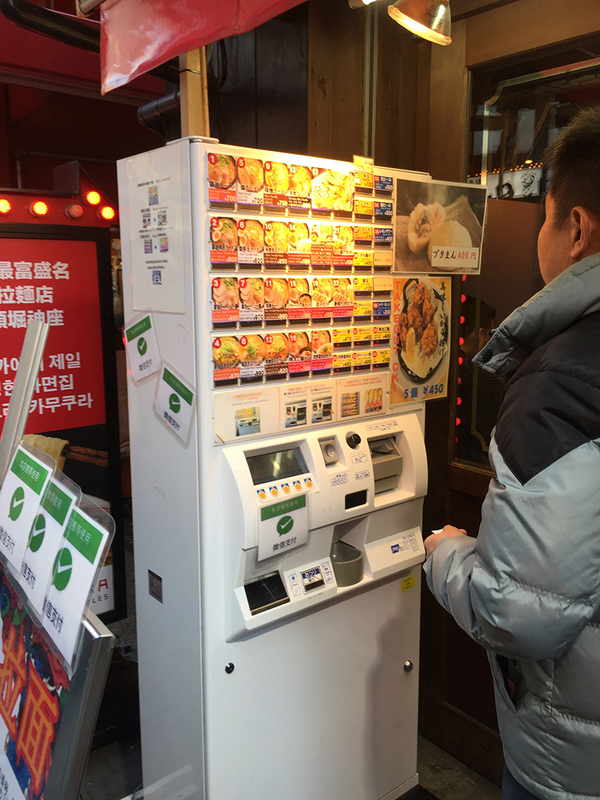 Surprisingly, few places in Osaka take credit cards, so we exchanged cash so we could place our order in the vending machine outside the restaurant. 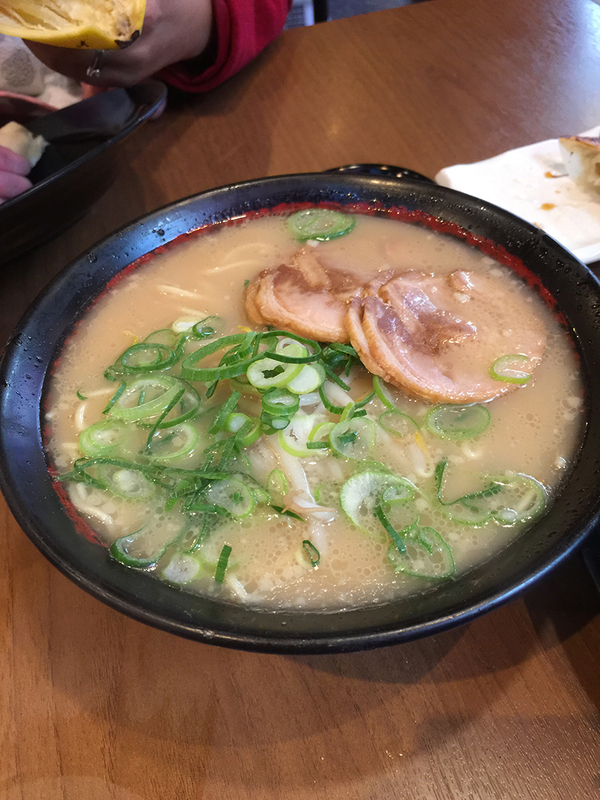 I had Miso noodles with Pork. It was rather salty and so delicious! Later that night, Leah and Emi were tired, so we went back to settle them in for the night. 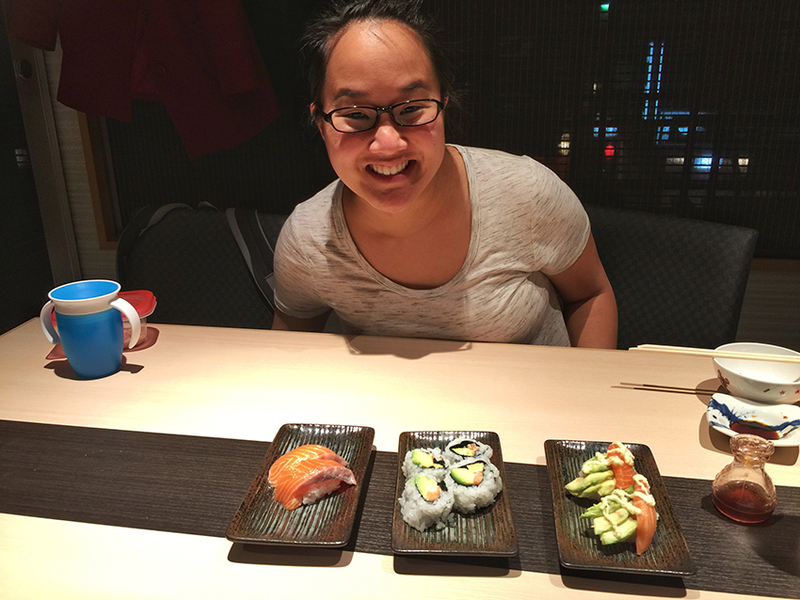 After bedtime routines, I went on the hunt for a good sushi restaurant. I have seen several pictures and videos of conveyor belt sushi restaurants and wanted to give one a try. 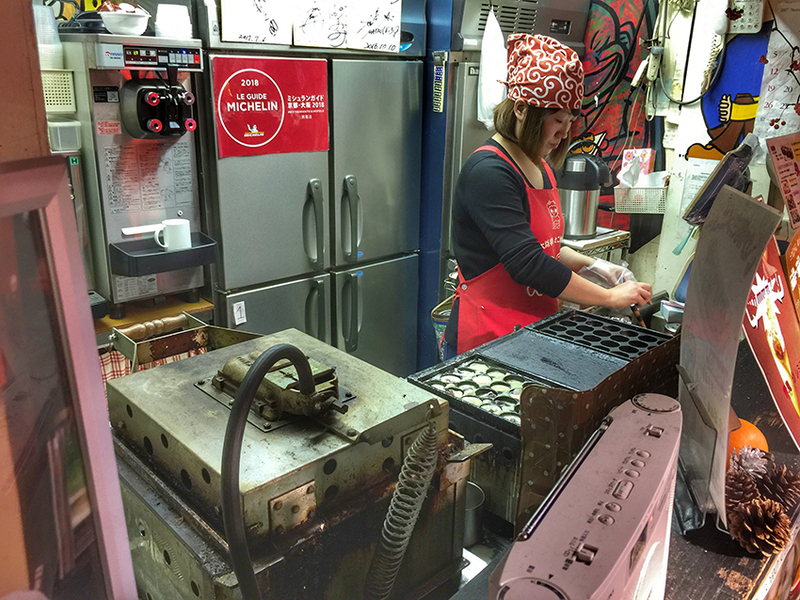 I headed back towards the Dotonbori area and came across Dotonbori Akaoni, a Michelin endorsed Takoyaki (たこ焼き) street food booth. Takoyaki is basically a fried dough ball with a small octopus inside. I stumbled upon this literal hole in the wall. 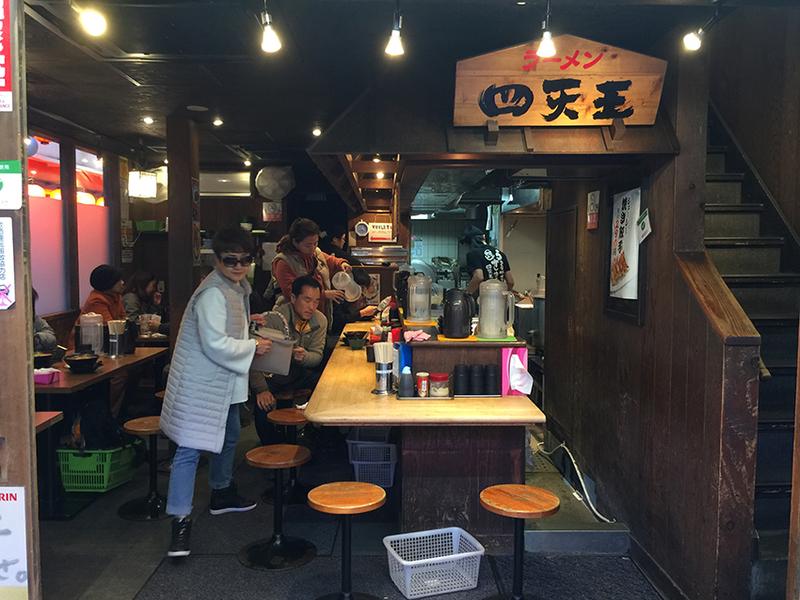 I ordered the basic takoyaki with spicy sauce for 500 JPY (about 4.5 USD). It was slightly chewy and had a spicy burn that didn’t quite settle in until a few minutes after. 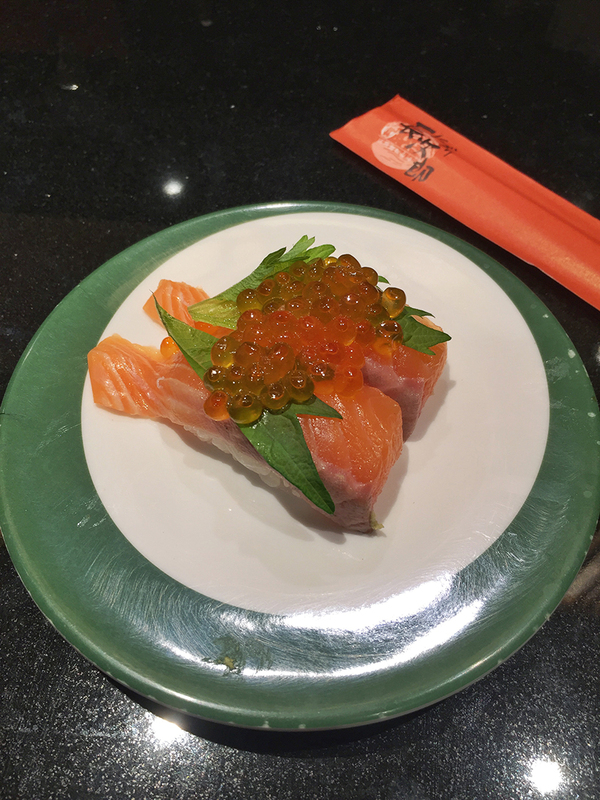 My hunt for sushi continued by walking through Dotonbori, which proved to be more challenging than during the day. The evening crowds were thick and lively during the dinner rush. 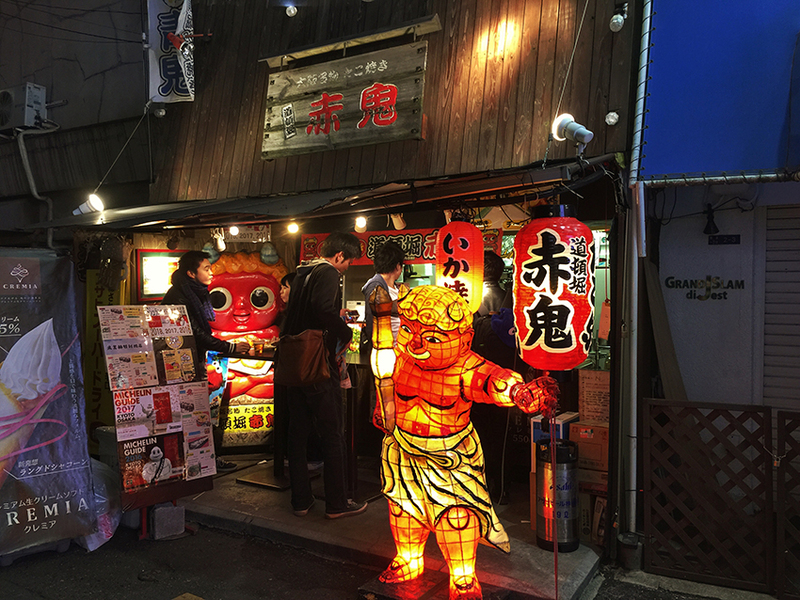 I found Genrokuzushi (Dotonbori), a touristy, but cheap sushi joint. However, the line went about 15 meters beyond the restaurant’s doors, and after not moving in line for 20 minutes, I moved on. 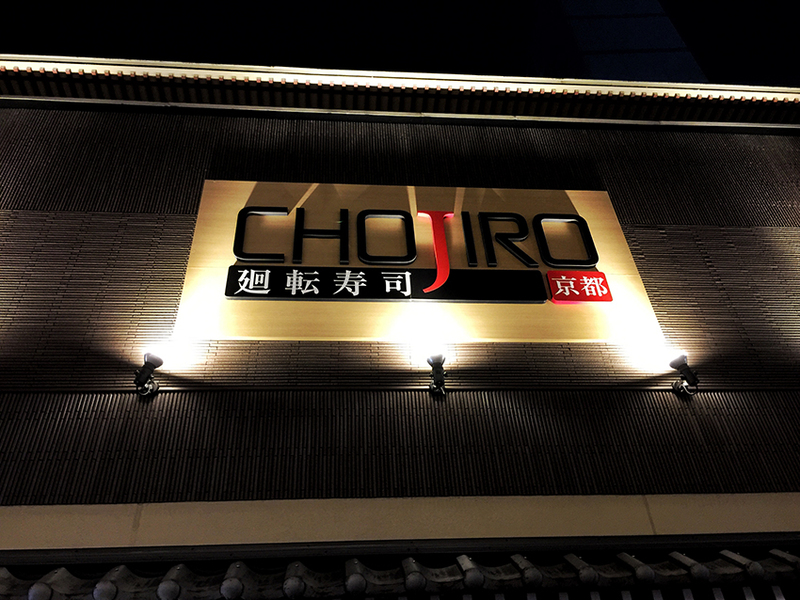 I eventually came to Chojiro in one of the side alleys. It was fairly affordable and the best quality sushi I’ve had so far. I enjoyed sitting at the conveyor belt and seeing the sushi being made right on the other side of the counter. 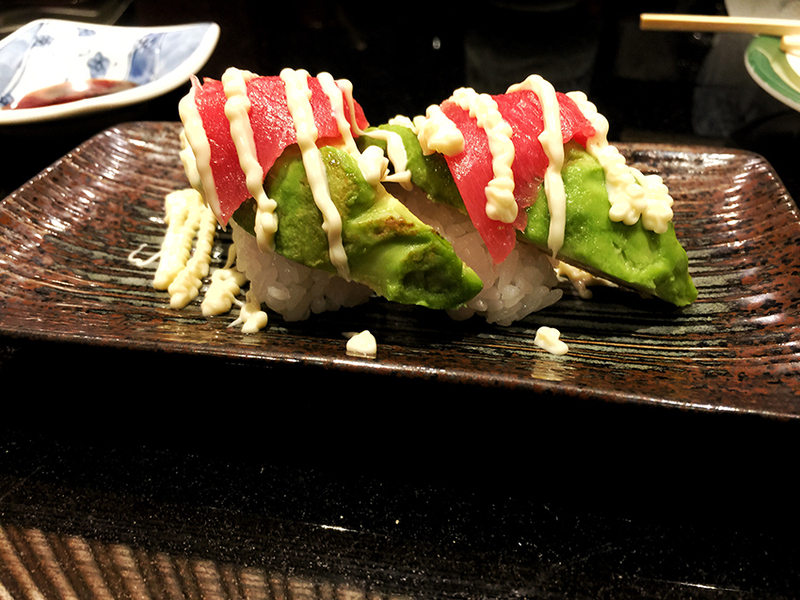 My favorite was the avocado tuna. It was so fresh! 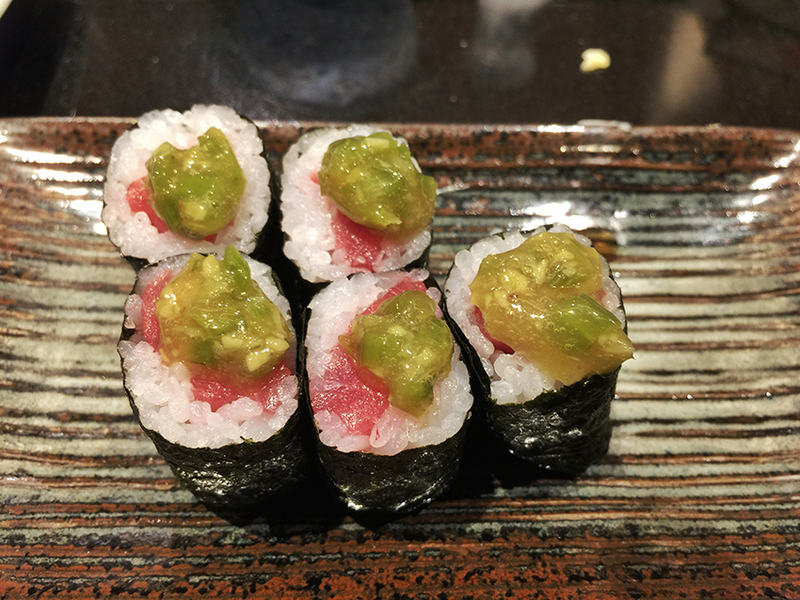 Another favorite was the Wasabi Tuna. The wasabi was so spicy, it felt like my nostrils were turning inside out! I loved it so much I brought Leah and Emine back the next night. They gave us our own private room with a sliding door! Either we looked fancy, or it was because of our lively 9-month-old baby (likely the latter). All three of us were exhausted, but enjoyed the fresh sushi (just rice for Emi) followed by matcha ice cream. We ordered with the restaurant’s automated ordering system on an iPad. 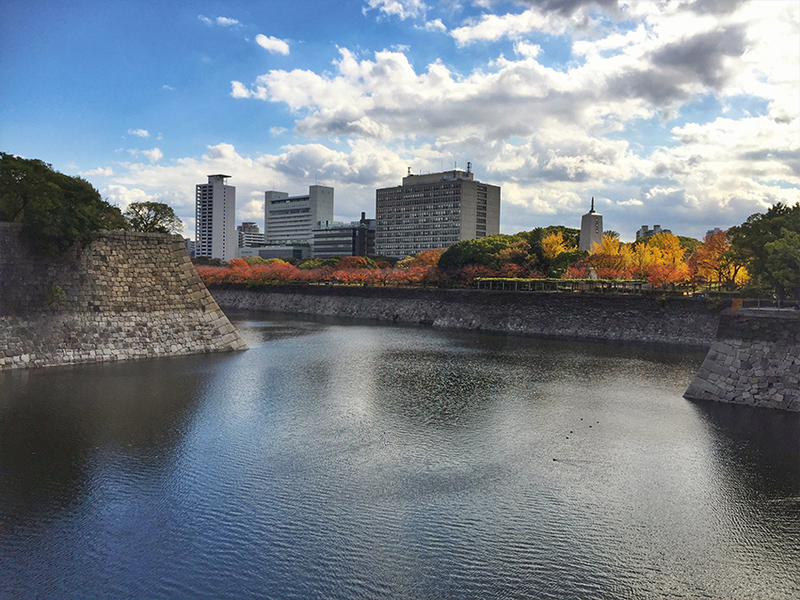 Although we only got a small glimpse, we loved the time we spent in Osaka on Friday. We spent most of the day Saturday in Kyoto before our meal at Chojiro. 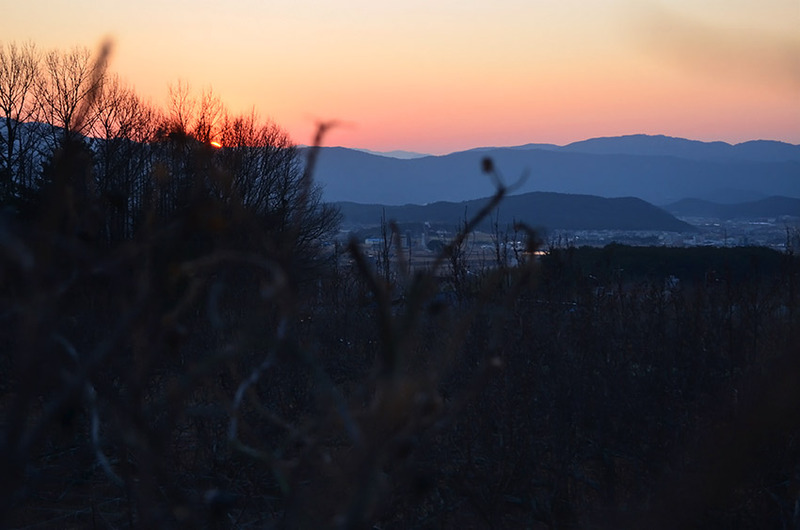 More on our time in Kyoto soon! 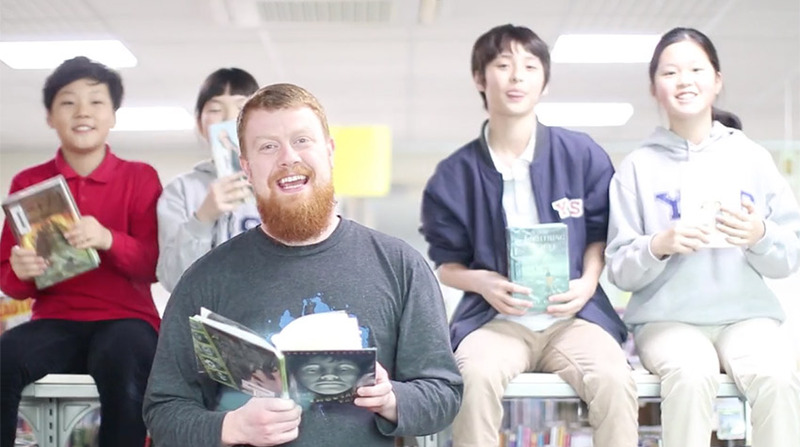 Read-A-Thon is back at YISS! Our elementary students celebrate reading during February and March. 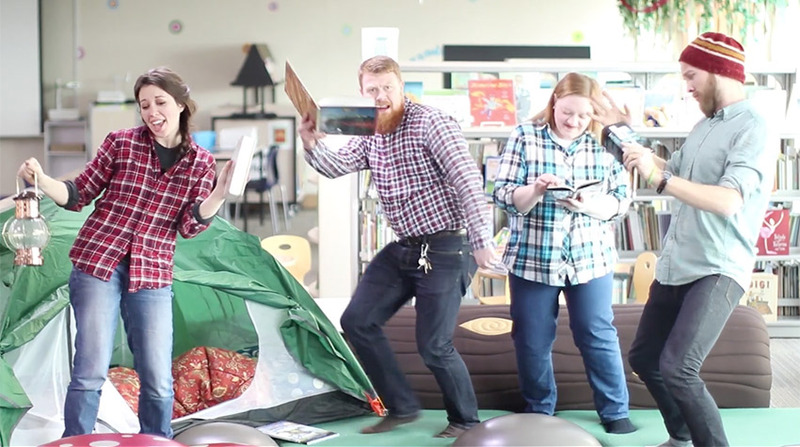 The theme this year is Camp Out with a Good Book. David helped with the music video again this year. He rewrote the words to Justin Timberlake’s “Can’t Stop the Feeling” and changed it to “Can’t Stop the Reading.” We work with so many talented people! 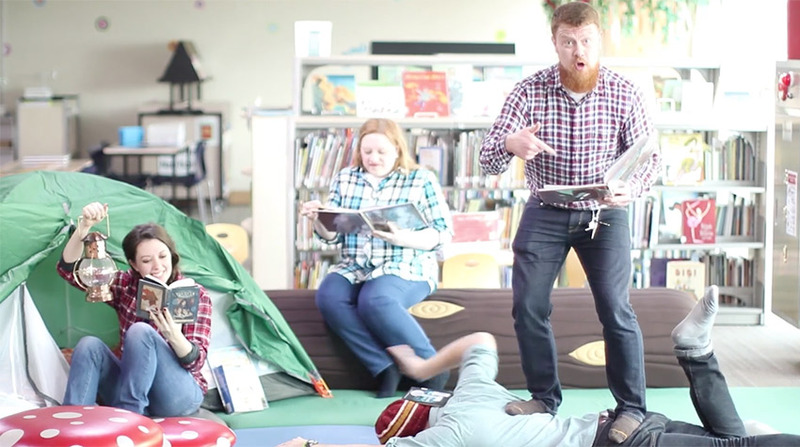 From singing to sound mixing, video editing, and dancing… I love how the final product showcases the creativity and joy of our school! What adventures will this new book take me on? 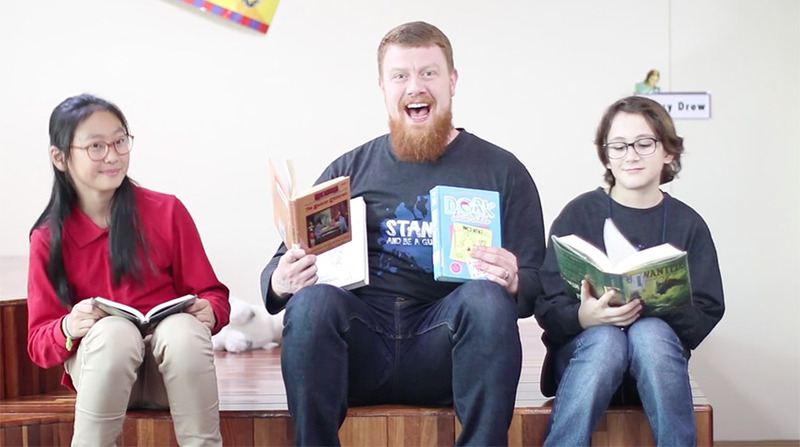 » Watch last year’s Read-A-Thon video “Good Book Life” here! Having a surgery is a scary thing. 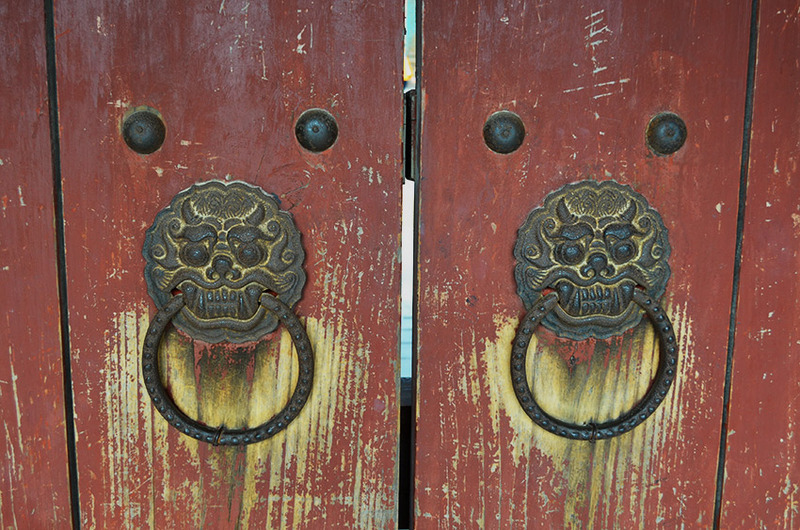 Having one abroad as an expat can be even more intimidating. 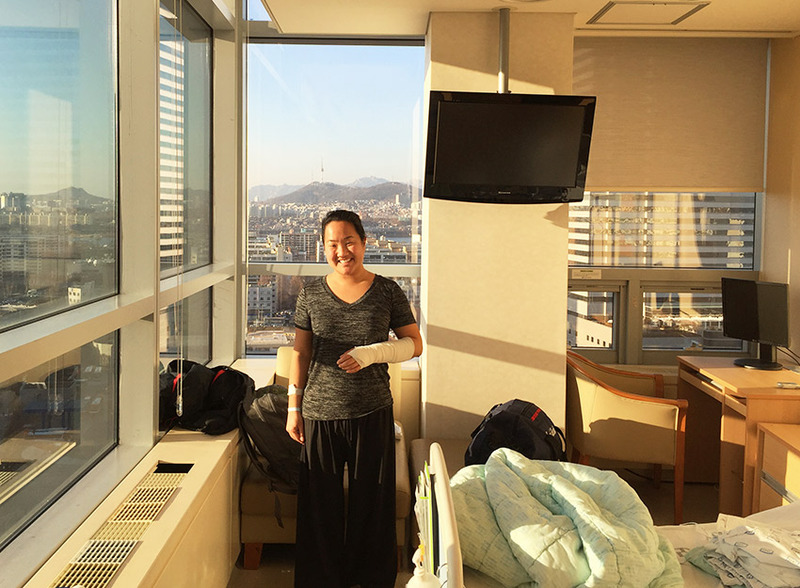 If you’re considering a procedure in Korea, I hope my experience can help ease some fears. Some of the protocol felt overkill (extended stay in the hospital) and a bit backwards (no physical therapy after the procedure). But despite the differences, everything went smoothly and I was glad I had it done. 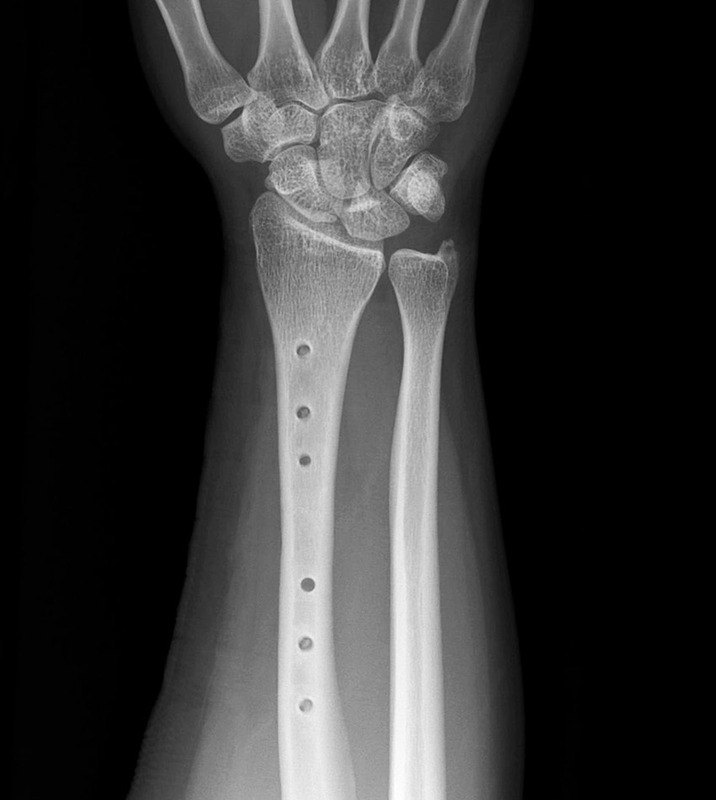 I broke my first bone in January 2015 in Turkey and had a metal plate put in my arm. 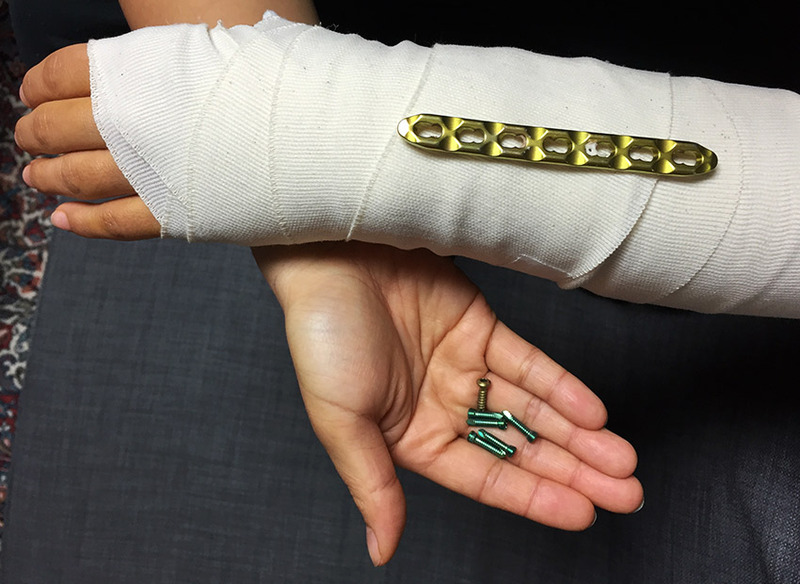 Due to some discomfort, I decided to have the hardware removed last month in Korea. I went to Seoul St. Mary’s Hospital at the recommendation of some friends. I called the international clinic to schedule an appointment. I was overwhelmed my first time at the hospital. 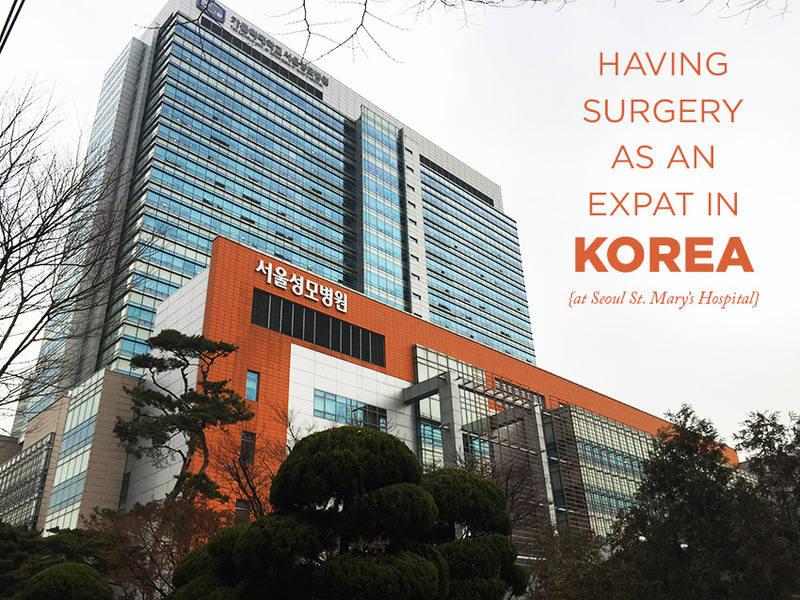 St. Mary’s is large, one of the top hospitals in Seoul, and is consequently booked and busy. The ladies in the office spoke English and were so helpful. There were a slew of forms, but St. Mary’s accepted my insurance and filed all of my paperwork. After I checked in, they sent me off with a map to get x-rays and meet with the surgeon. My meeting lasted just a few minutes, and by the end, I had booked the surgery. I was at the hospital for two hours. A month before the surgery, I took a series of tests: chest x-ray, breathing, blood (vein and artery), urine, and EKG. 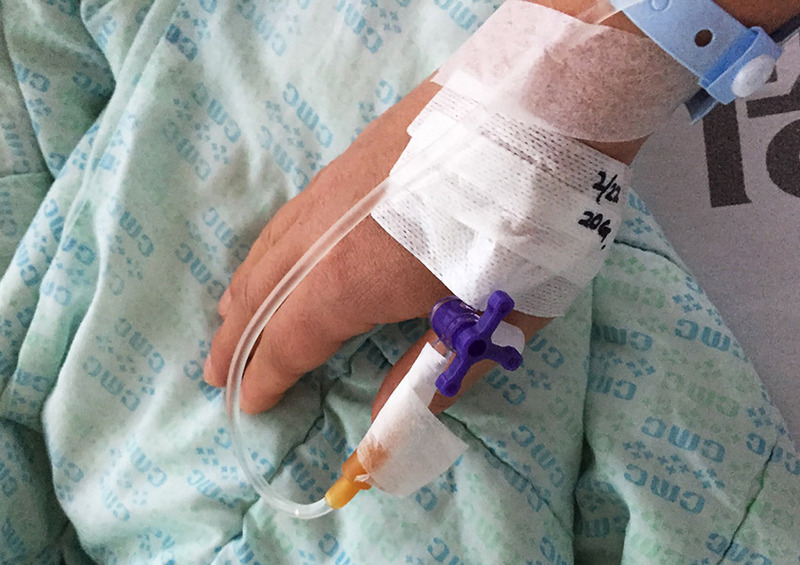 I met with the anesthesiologist two weeks before the surgery. A translator sat in and this meeting took only a few minutes. For some reason, I was never asked about allergies before that point, so I was sure they added that information to my file. I went into the hospital the day before (about 24 hours before) the procedure. They said they’d take me back between 12–2 the next day, but they couldn’t fit me in until 4:30. The Room: My insurance covered a double room, but they were all occupied. Instead, I got a private room. We felt so spoiled. 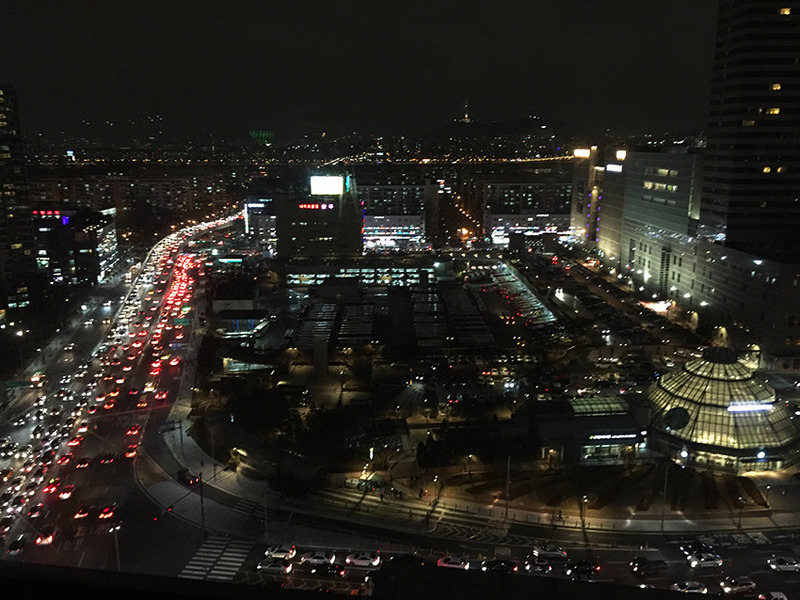 It was on the twelfth floor and had an great view of Gangnam. The room included a desk with computer (which we didn’t use), a TV, a storage closet with a keypad locking system, a small fridge, a private bathroom with shower, and a small couch. The Food: I received an evening meal. I chose the Western menu over the Korean (just in case to avoid anything upsetting my stomach). The food was good, but a little bland. They served a cream soup, spaghetti, salad, bread, drink, and a pastry dessert. I was given a form to select my future meals. We met with a doctor (not the surgeon but someone in their residency) later in the evening. He spoke English and was very kind. He answered our questions and kept asking until we had exhausted everything we hadn’t covered in the initial consultation. Nurses came to take my vitals throughout the night and next day. The waiting was the hardest part. 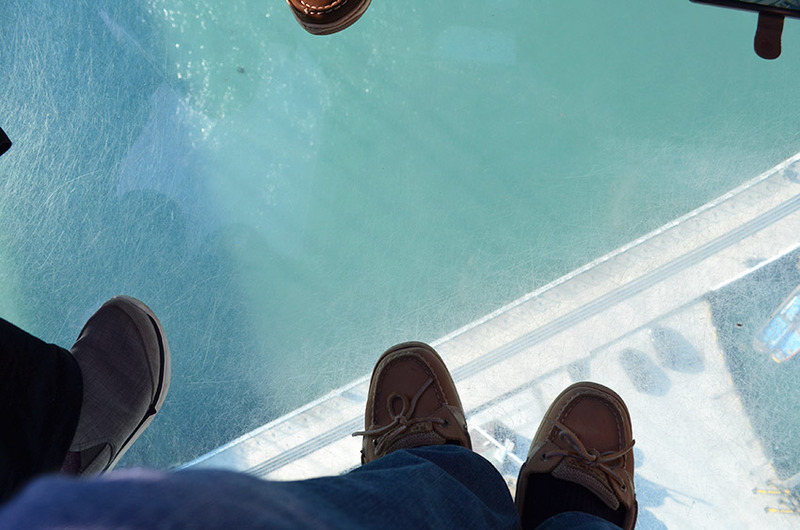 By the time they wheeled me back, some of the nerves had worn off and I was ready for it to happen. David walked with me up to the operating room doors. I was glad the surgery was in the evening. After I woke up from the anesthesia, they wheeled me to an x-ray room on the second floor. This area is usually packed, but because it was around 7:00pm, there weren’t people staring at me on my bed. Back in the room, I had to stay awake until 11:00pm. I was able to drink water around 2:00am. They had no food for me, and I didn’t eat until the next morning. They brought a full breakfast (eggs, fruit, cereal, pastry, juice), though the nurse told me to only have soup until lunch. They didn’t provide soup and I didn’t think convenience store ramen would be good for my stomach. Instead, I had some crackers and yogurt David had bought. 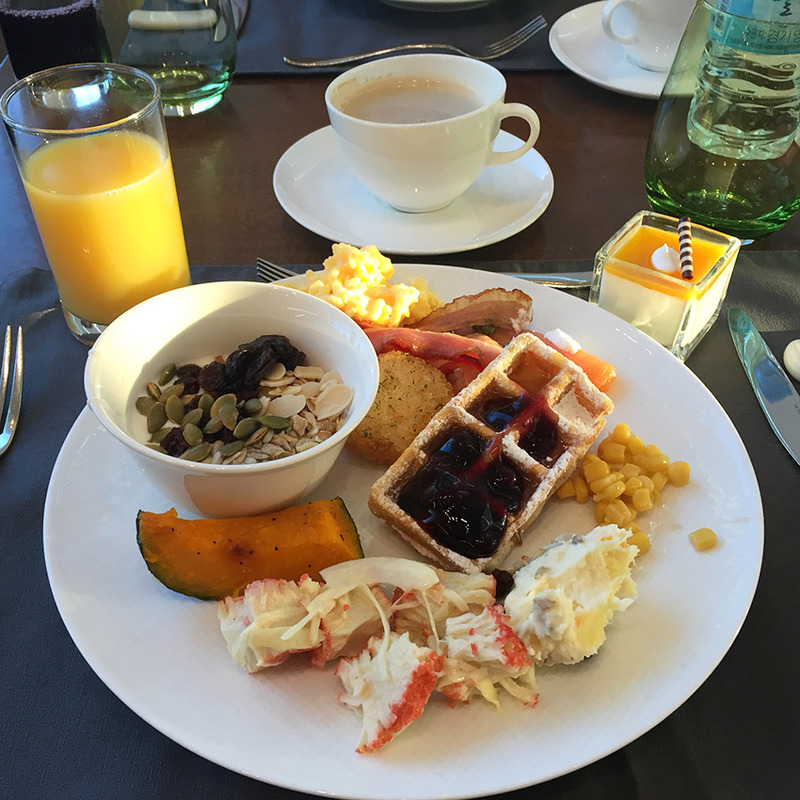 That sat fine, so I ate the breakfast a little later. Another thing we felt spoiled by: they let me go home early. I was supposed to stay another night (for a total of 3 nights), but they let me go home around 4:00pm the day after surgery. They also let me keep the hardware! The bracket is about 4″ long. After I saw the metal, I felt good about having it removed. It had done its job and there was no need to keep the foreign material in my body. I was amazed at my recovery time. I gained strength and mobility much faster than I had anticipated. The surgeon did a fantastic job. 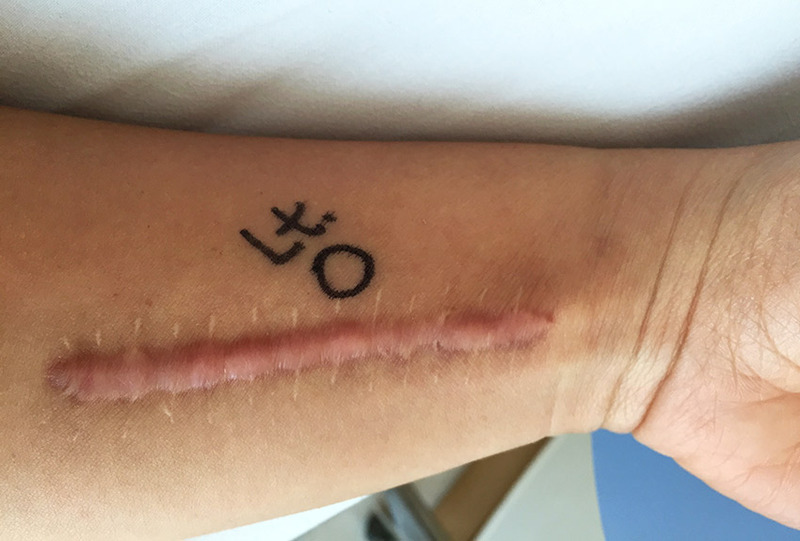 He cut out some of the scar tissue and the keloid. They didn’t use stitches, but glued me together. Someone told me if you’re going to have surgery and are concerned about scarring, Korea is the place to get it done. They are very conscious about how they look. 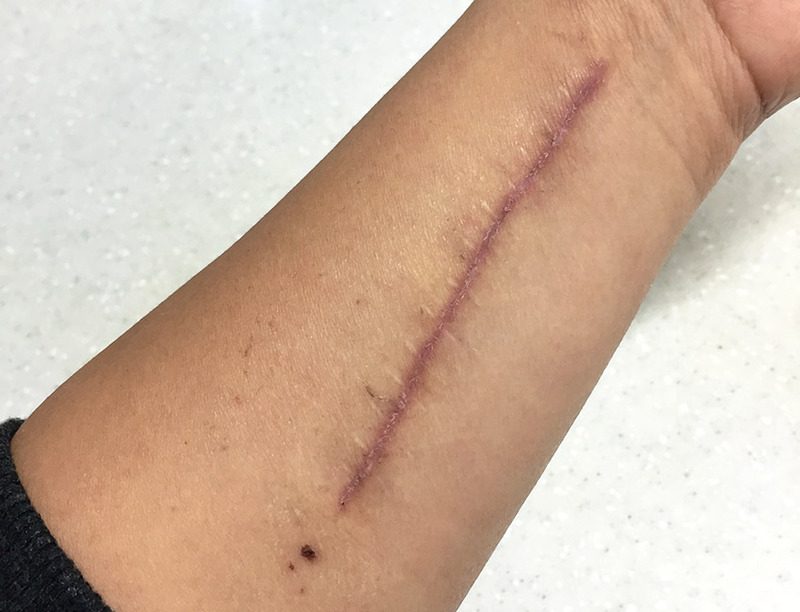 I have a silicone scar reduction gel and cream, and I hope to avoid keloiding this time. 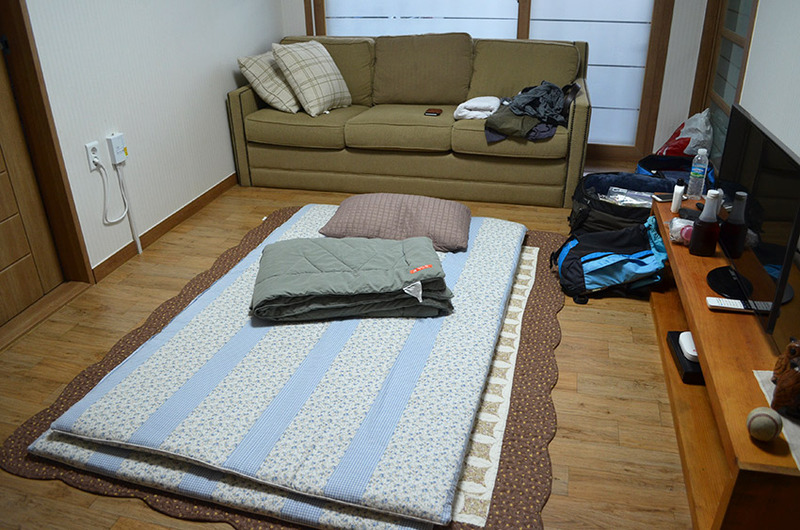 Upon arrival, a translator took me to the room and explained the basics of what to expect. Shave the area where you’re going to have surgery or bring a razor to do it there. David had to buy some from a convenience store. The nurse offered a hair removing cream, but I have sensitive skin and didn’t know if I’d react to it or not. Take off all nail polish if you’ll be under anesthesia. Physical therapy is not emphasized in Korea. My doctor said they didn’t have hand specialists at St. Mary’s, but I got him to write a referral letter. There is a physical therapist at my chiropractic clinic in Itaewon. Visiting hours were from 2:00pm – 8:00pm. The international clinic closes at 5:00pm on weekdays and noon on Saturdays. The nurses I interacted with knew enough English to help. Google Translate is always helpful, too. I am thankful for a successful surgery and for the friends that came around us! Working at an international school is fun for many reasons, one of them including regional holidays off of work. 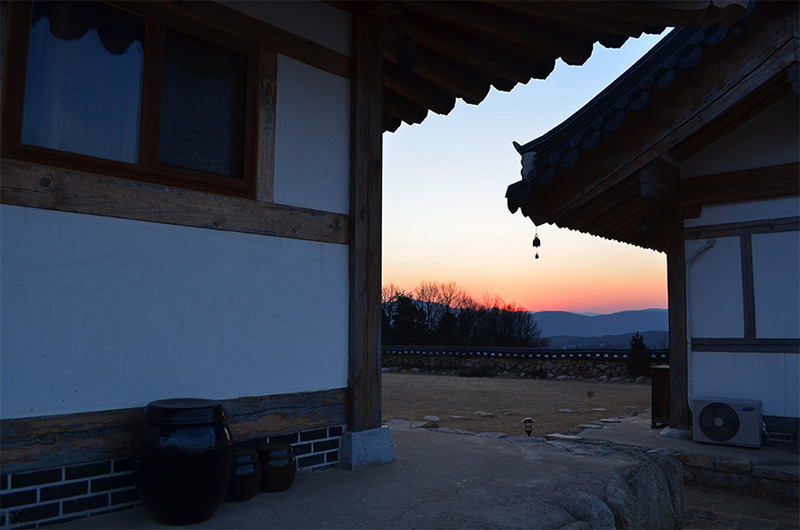 Lunar New Year was the second week in February, and we traveled southeast with some friends to Gyeongju (경주). 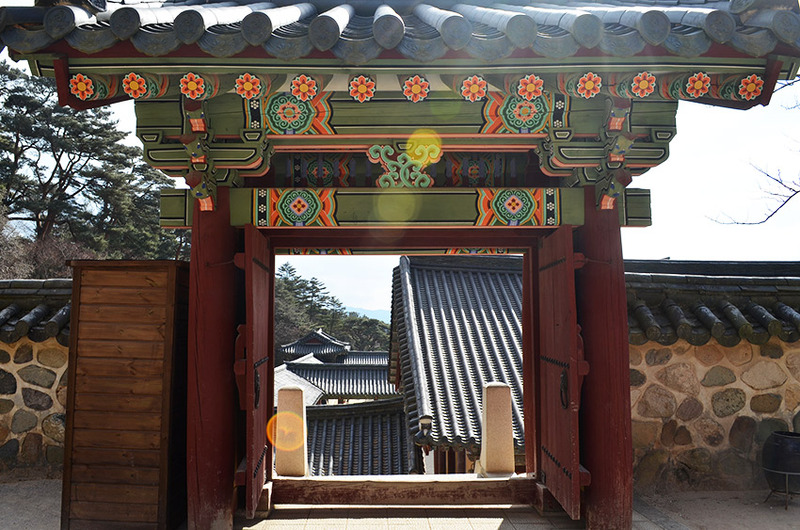 Lunar New Year is one of the biggest holidays in Korea. 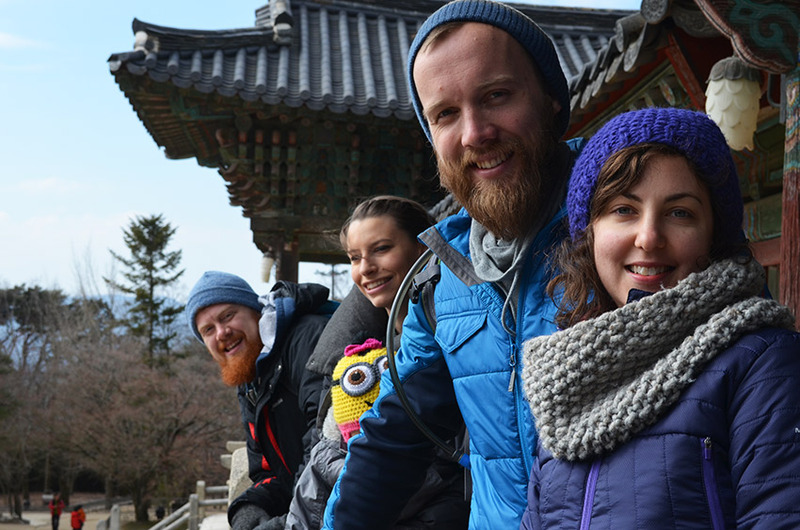 Often, people travel from Seoul to their hometowns to spend time with extended family. Thanks to a friend, we were able to get standing room tickets on the KTX speed train. 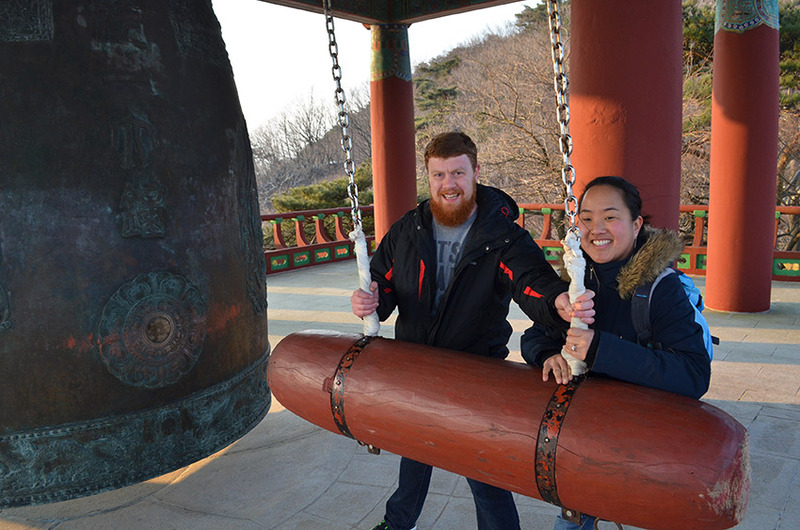 We left Saturday morning and two hours later arrived in Gyeongju! 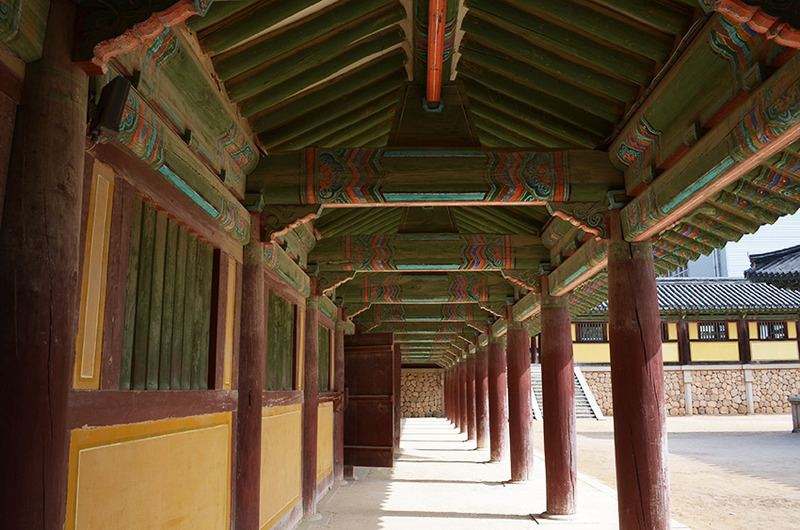 Gyeongju is an important historical city. 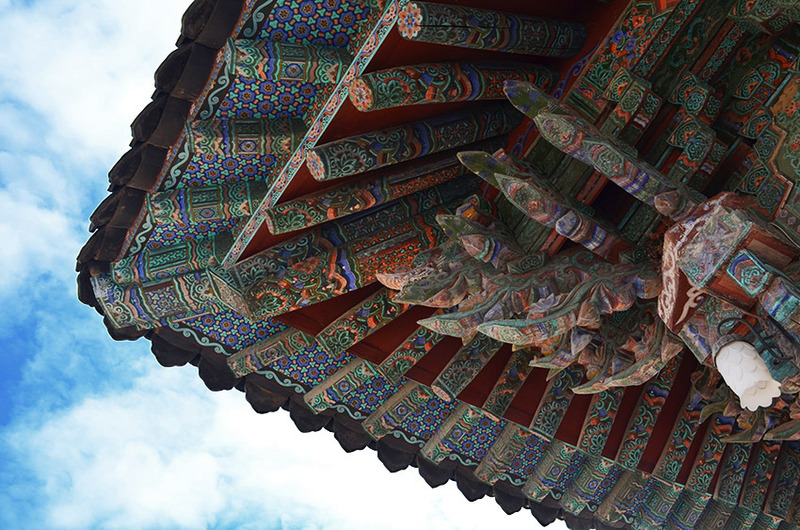 It was the capital of the Silla kingdom which ruled about two-thirds of the peninsula between the 7th and 9th centuries. Today, it’s no longer the capital, but a smaller city. 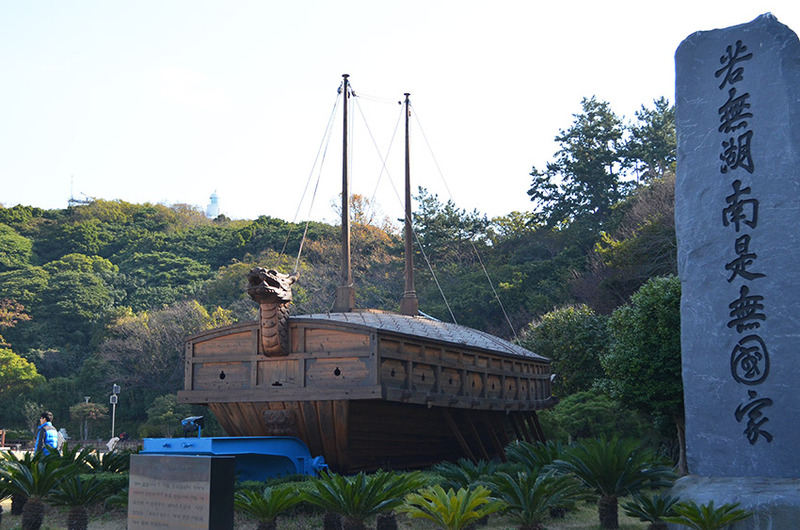 There are many historical sites, which is a draw for tourists. 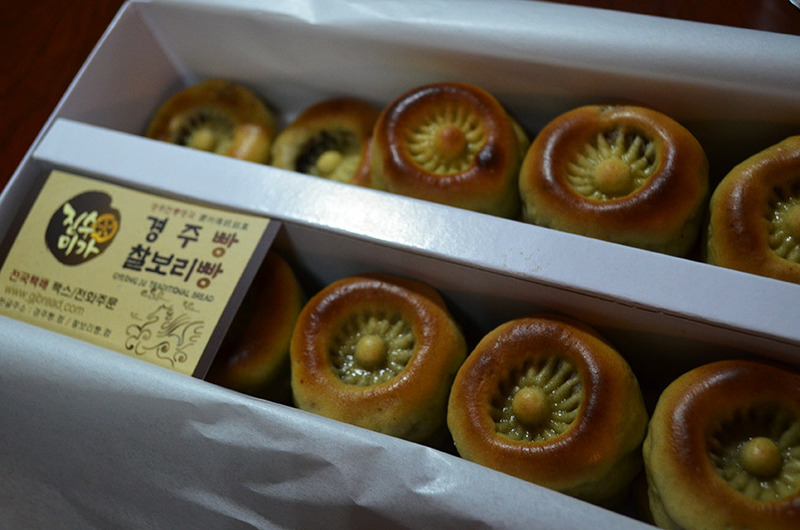 We tried Hwangnam bread, which is original to the region. The pastry is filled with a dense, sweet red-bean paste. 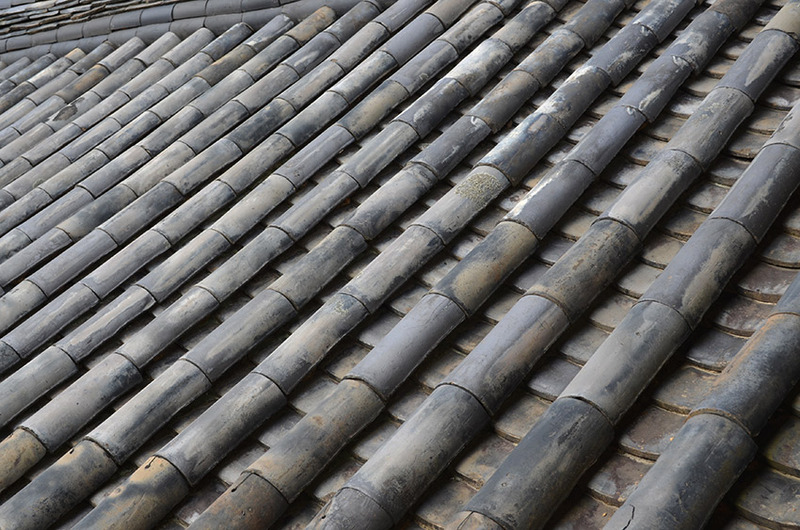 It was first baked in 1939 and is now sold throughout Korea. 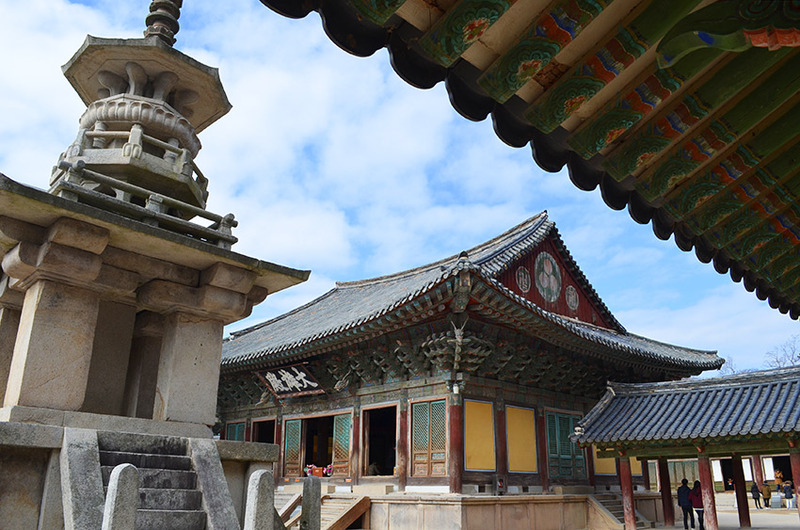 One day, we visited Bulguksa Temple (불국사), a UNESCO World Heritage Site. Admission cost ₩5,000 for adults. 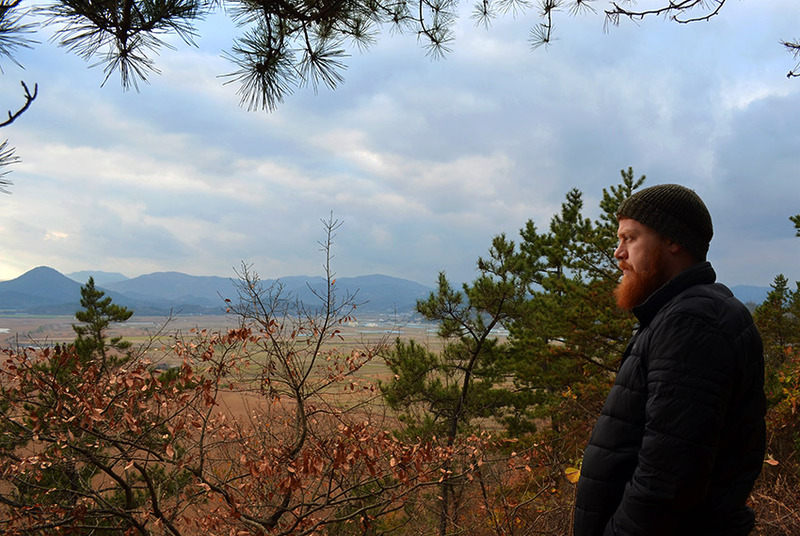 The next day, we decided to hike to the Seokguram Bell Pavilion, which we could see in the distance from our house. We went way off the beaten path and walked up and down some major hills. My phone said we climbed 155 flights! We also took a wrong turn so our hike ended up being over five miles. But we enjoyed the company, sunshine, and fresh air. When we got to the bell, we only stayed five minutes because we saw the bus and didn’t want to wait another hour to get back into town. Though there was a lot more we could have seen in and around town, our weekend was perfect. It was a relaxing retreat to be outside the city. 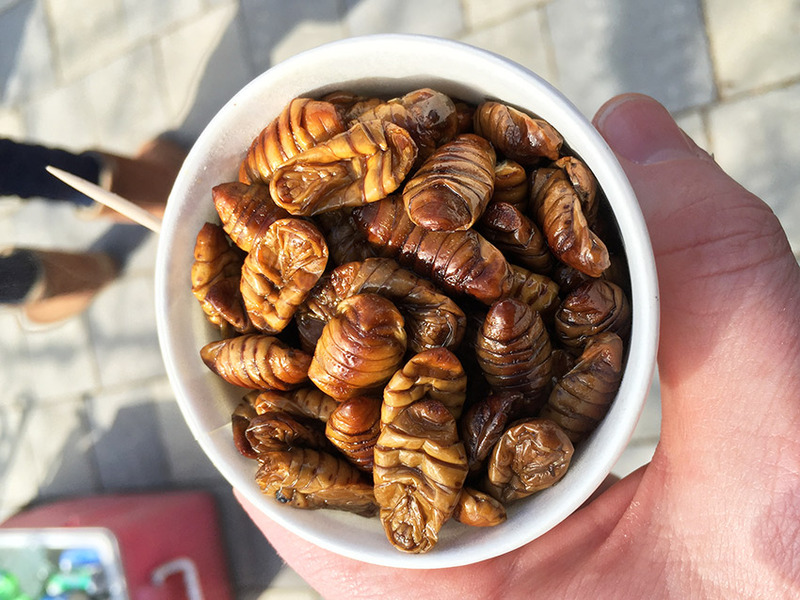 So… I ate a bug in Korea. Beondegi to be specific. 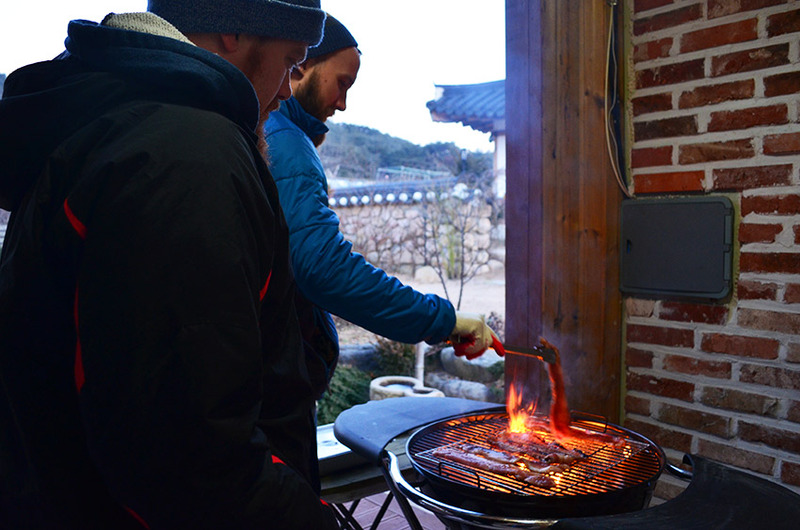 We’ve been in Korea for about six months and we’ve really enjoyed the local food. Eating is one of our favorite pastimes, and we like trying new things. Even when we’re a little skeptical. 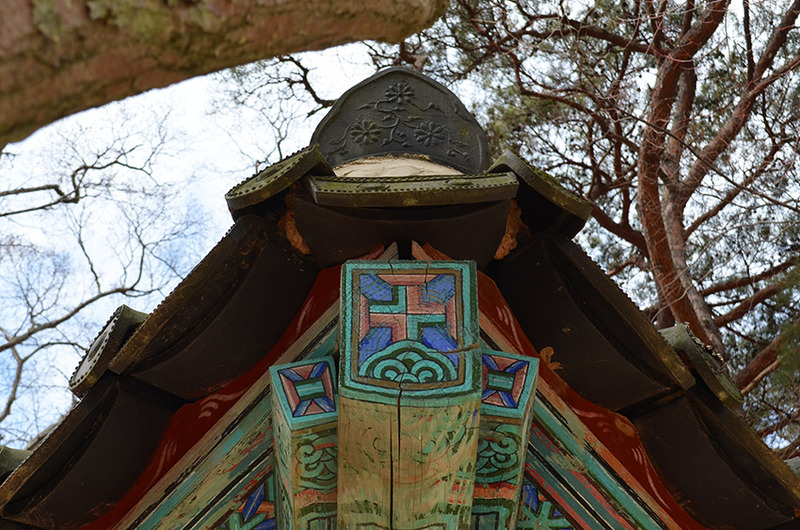 We traveled southeast to Gyeongju the first weekend of February with some friends for Lunar New Year. (More on that soon!) While we were out one day, we walked by street food vendors. 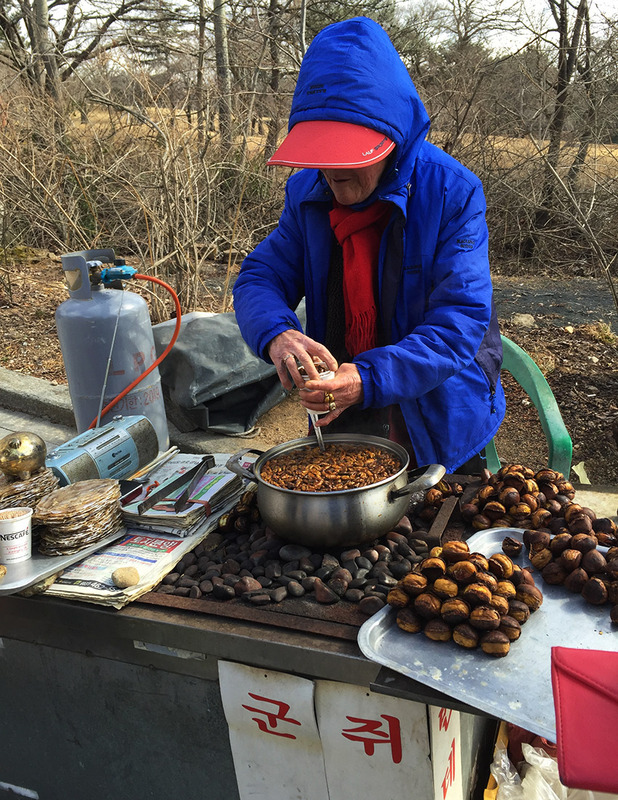 One lady was selling beondegi (번데기). 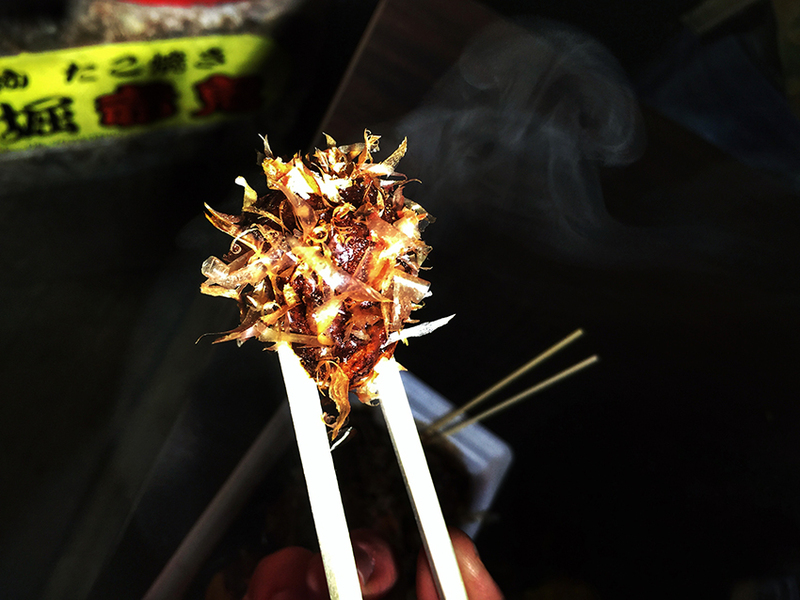 I had no intentions of ever eating this food, but… when everyone was trying it, might as well? 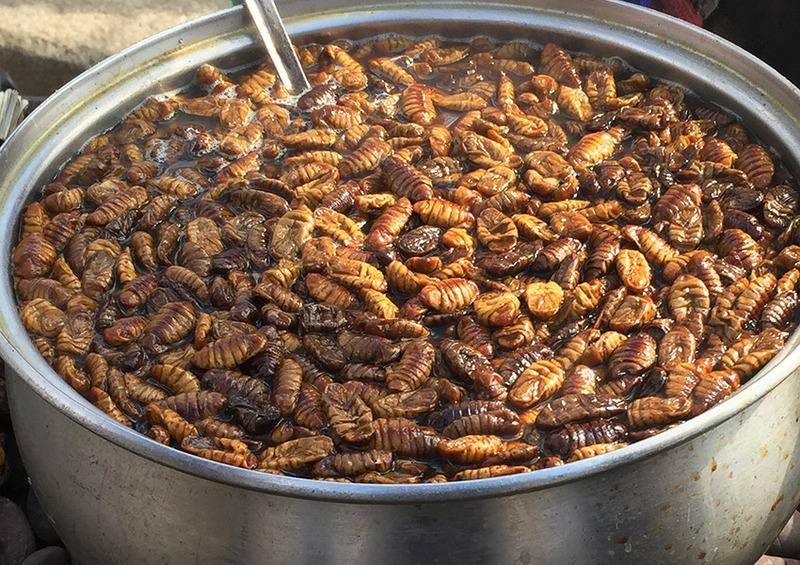 Beondegi is boiled and seasoned silkworm pupae. (Pupae is the stage between the larva and adult form when the bug is in the chrysalis stage.) 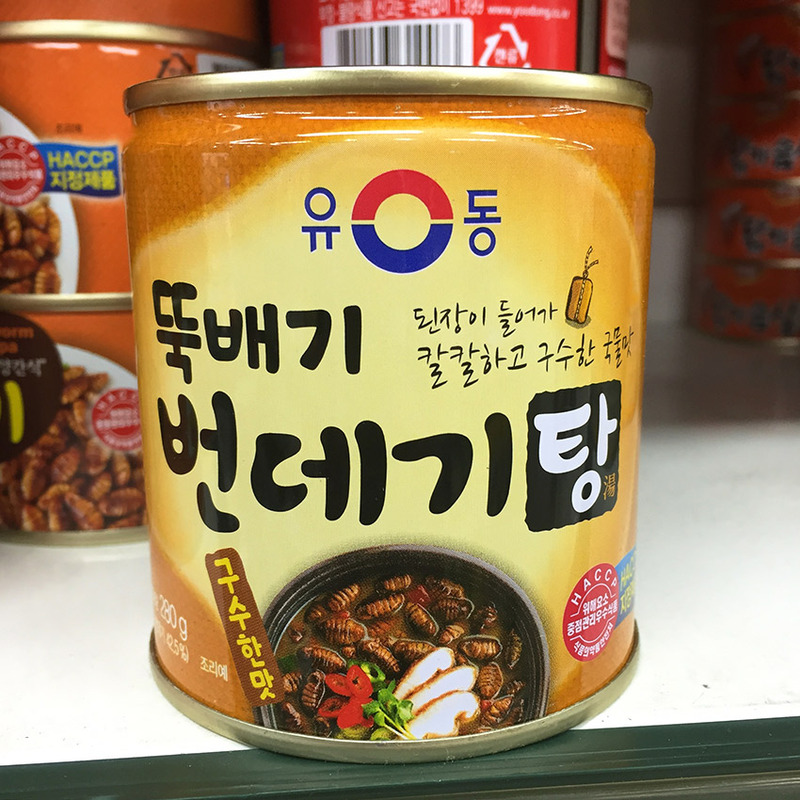 Korean people eat beondegi as a snack, though I wouldn’t call it the most loved or popular food of choice. 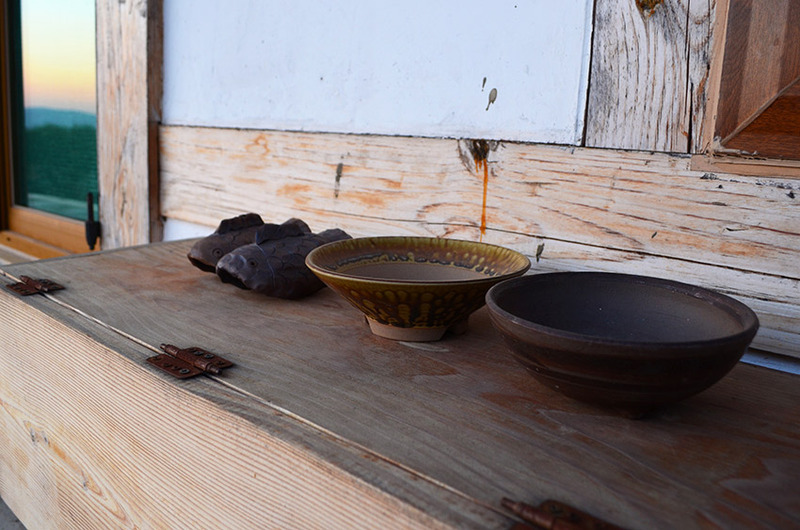 We often see food vendors with a long line of customers, but I never see a line at beondegi pots. According to earthexcursion.com: “Beondegi came to rise as a much needed source of protein during the Korean War because protein was scare, as well as many other macro nutrients.” I think we paid ₩2000 for a small paper cup (about $1.65 USD). It was MORE than enough. …Not as bad as I thought it would. It was a little bit fishy and nutty to me. Some of our friends thought they tasted similar to boiled peanuts. It was a little crunchy and a little chewy. Thinking about what I was chewing was the worst part. I turned 28 on the last day of January. This was the first year I celebrated my birthday in my birth city. I now live just seven miles from the place I was born. A couple of weeks ago David and I tried to find it. The address I had from my adoption paperwork didn’t quite work with today’s streets (in 봉천동 관악구). We thought we may have found it but couldn’t be sure. 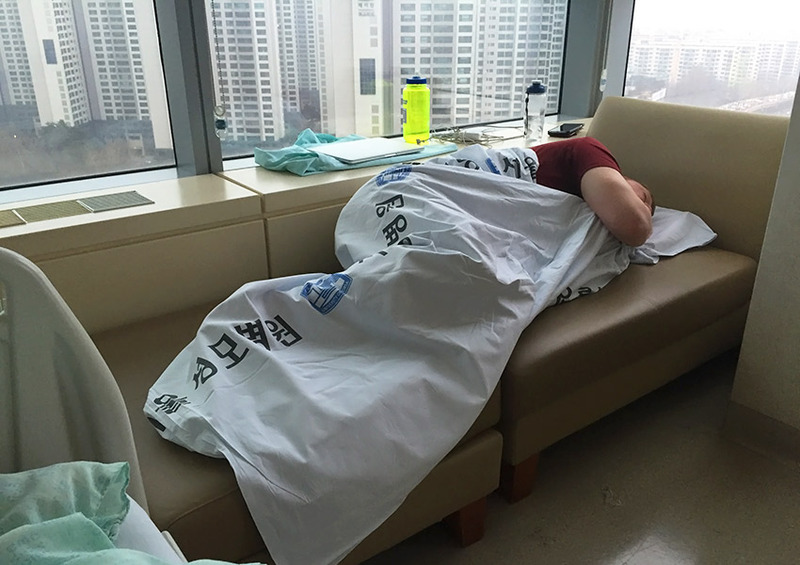 We didn’t know enough Korean to find out how long the hospital had been in business. 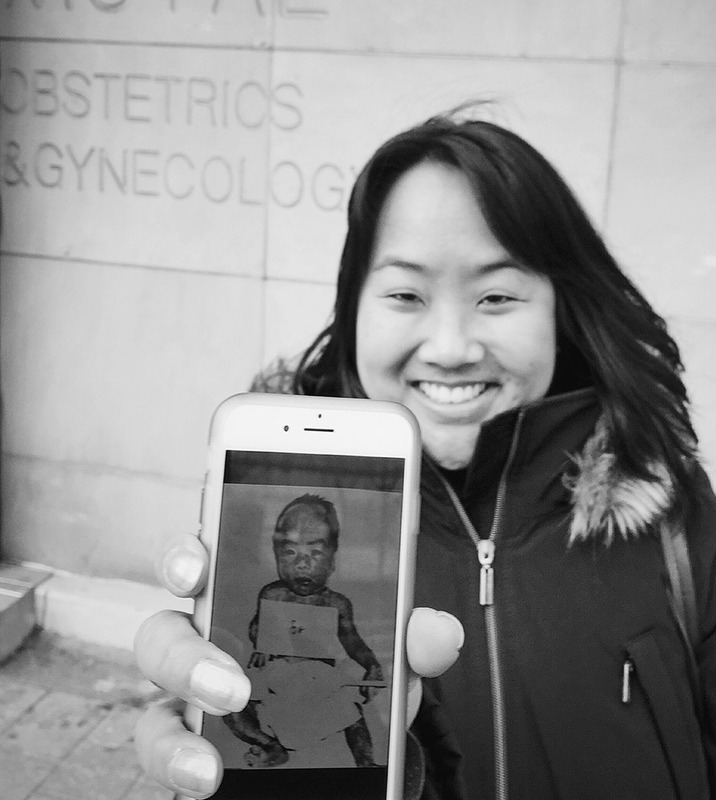 I was born at 33 weeks and weighed 2 pounds, 11 ounces. 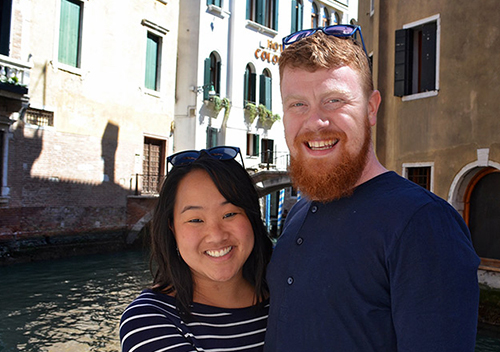 My 20-year-old unwed birth mother could not pay the incubator fees, hadn’t heard from the father in a while, and chose to put me up for adoption. As we were walking around the neighborhood, I thought how scared she must have been to be alone and in labor so early. I’m thankful for her bravery to choose life. Even more, I’m thankful for my family who chose me, love me, and call me theirs… And for a Heavenly Father who orchestrated it all. 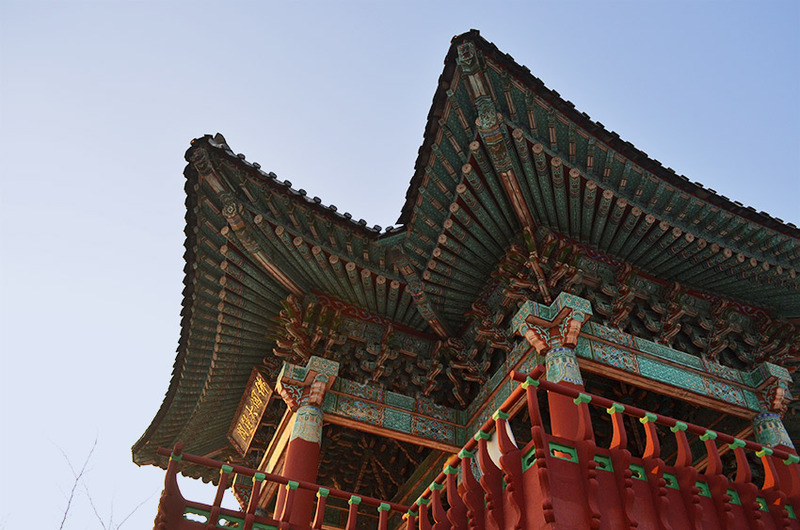 I never intended for Korea to be a place of pilgrimage. And I wouldn’t have believed it if you told me I’d be living here one day. Finding more information about my roots is not a void I am trying to fill. However, while I’m here – why not? 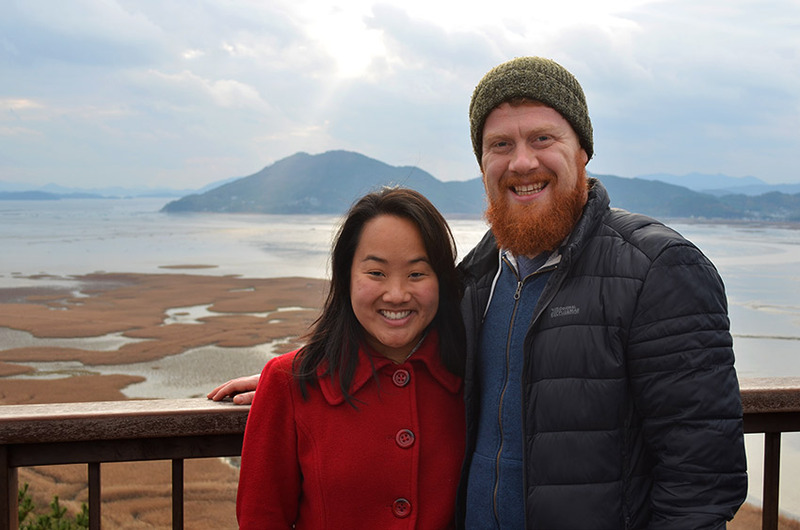 I filled out some inquiry paperwork for the Korean side of the adoption, and we’ll see what (if anything) comes back. I’m still figuring out my place and purpose here, but I am grateful for the adventure! David’s school has a working relationship the Korea Foreign Schools Foundation. 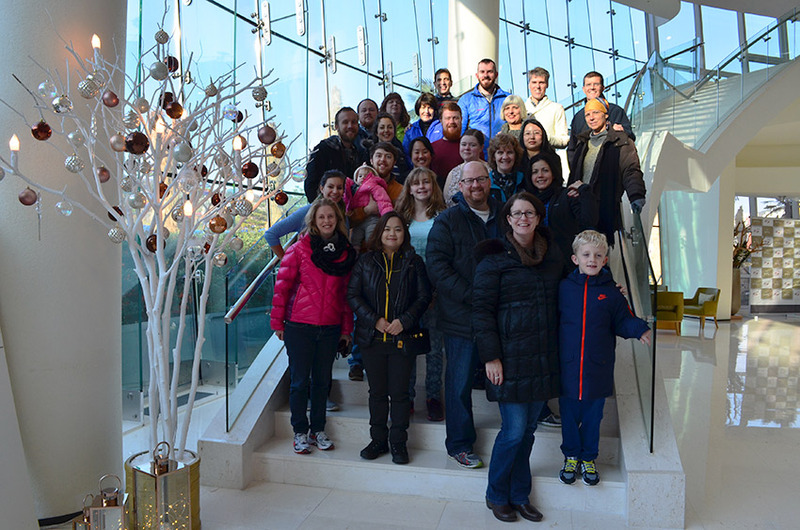 This group is so very generous and offers cultural trips to teachers twice a year! We were so excited when we found out we made it on the list for the trip over Thanksgiving weekend. It was a quick trip; we left Friday morning and returned Saturday evening. 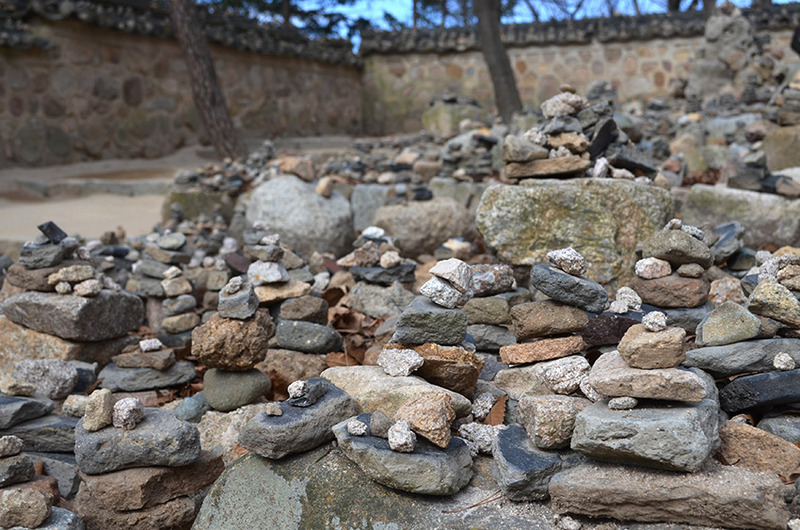 The foundation organized everything – transportation, lodging, and food. It was nice to just be along for the ride! We left Seoul on the KTX speed train. Some of our friends clocked the train at the top speed of 184 mph! 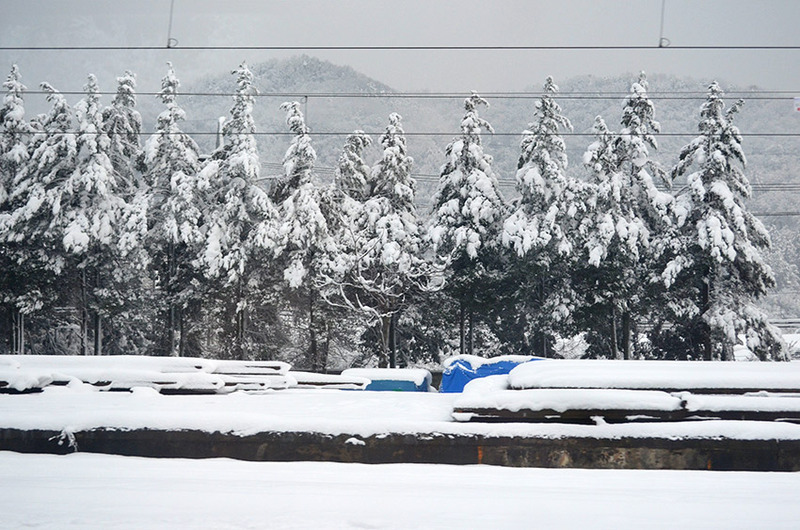 Even though the snow didn’t stick in Seoul on Thanksgiving, we passed fields and mountains loaded with snow. 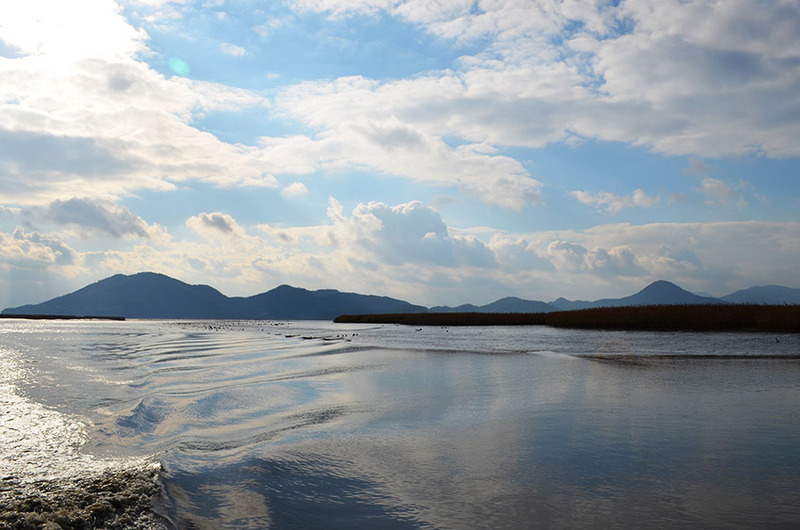 Just 2.5 hours later, we arrived in Suncheon Bay (순천만). 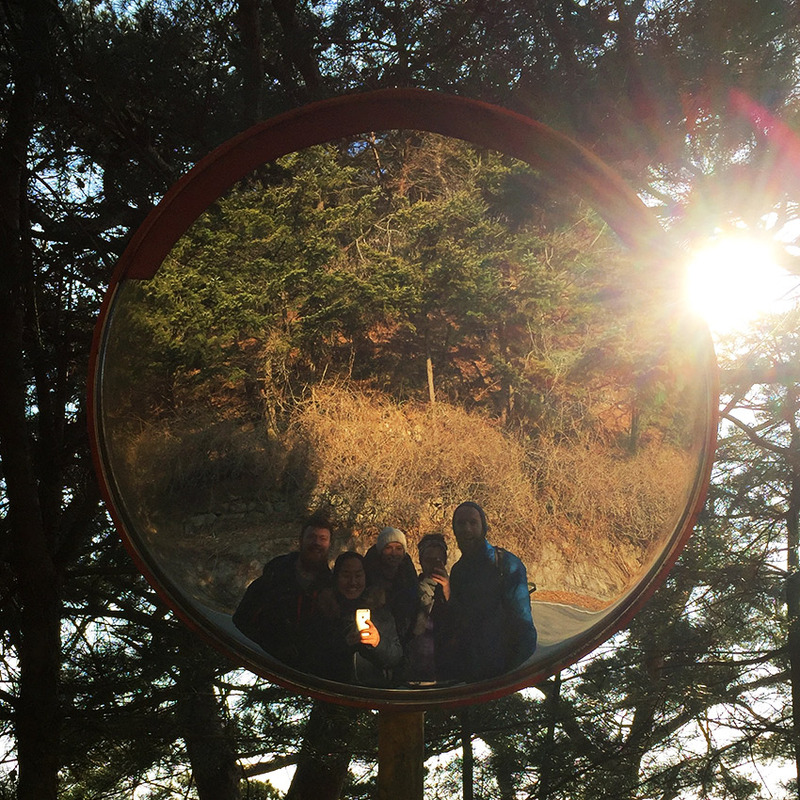 After a delicious Korean BBQ lunch, we spent a short 30 minutes at the Suncheon Open Film Set, the largest film site in Korea. 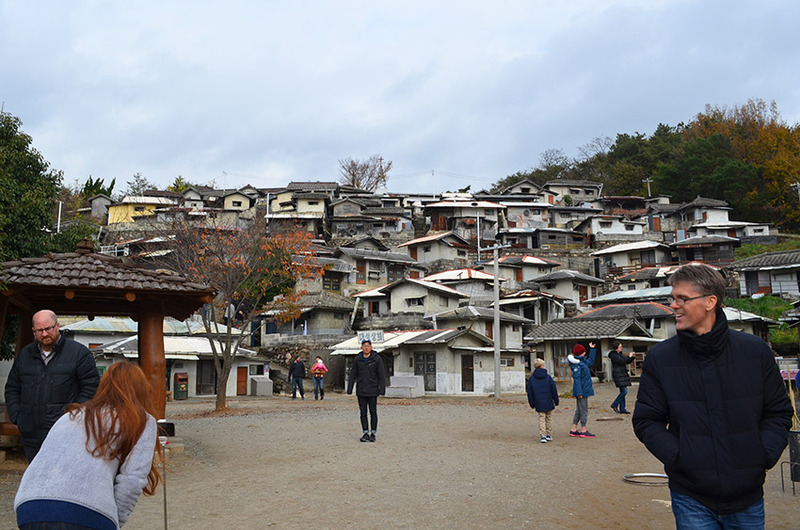 The place consisted of three villages representing the 1950s to the 1970s. I haven’t seen any Korean dramas or movies yet, so I didn’t recognize any of the sets. 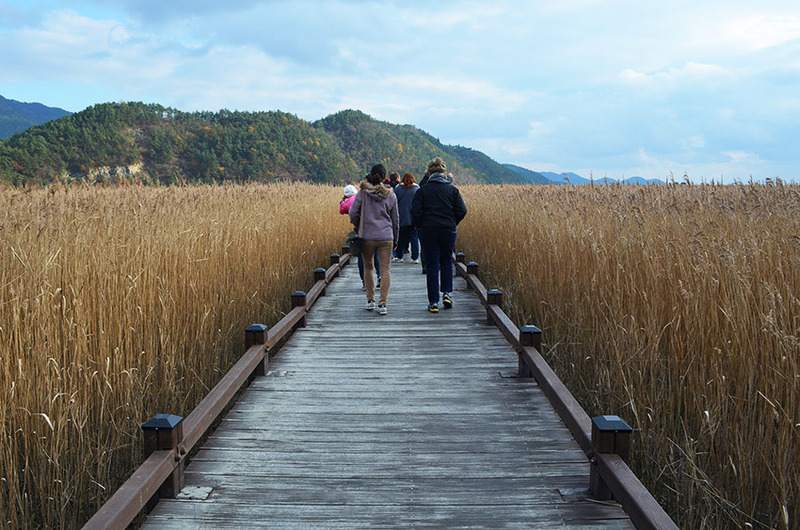 Next, we took the tour bus to Suncheon Bay Ecological Park (순천만자연생태공원). 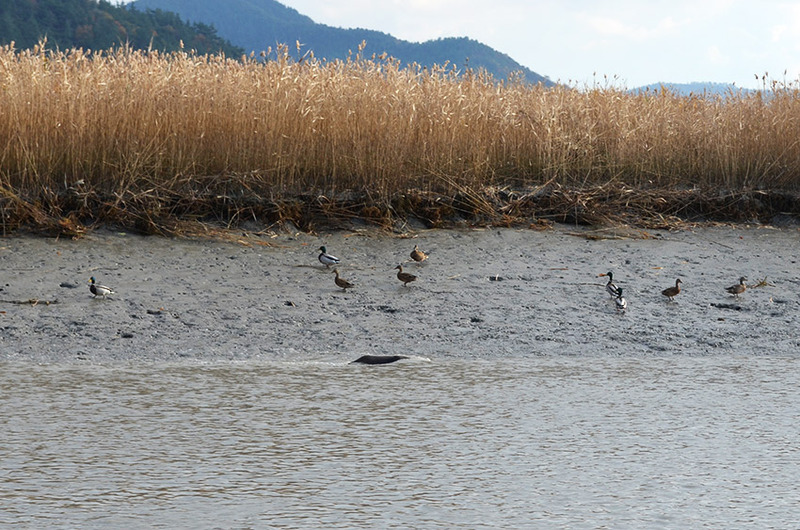 This wetland preserve had the largest reedbed in Korea, mudflats, and plenty of wildlife, including the rare hooded crane. We took a ferry boat ride and hiked around the grounds. 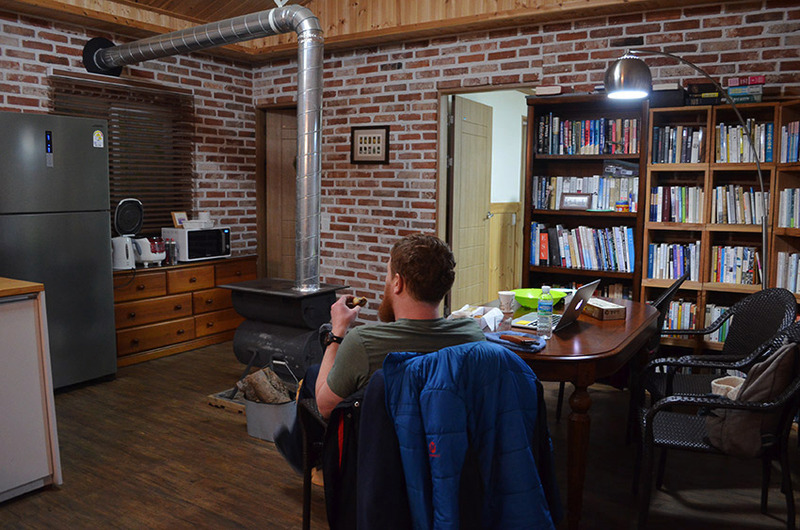 The foundation put us up in an incredible hotel in Yeosu (여수) called The MVL (which stands for Most Valuable Life). 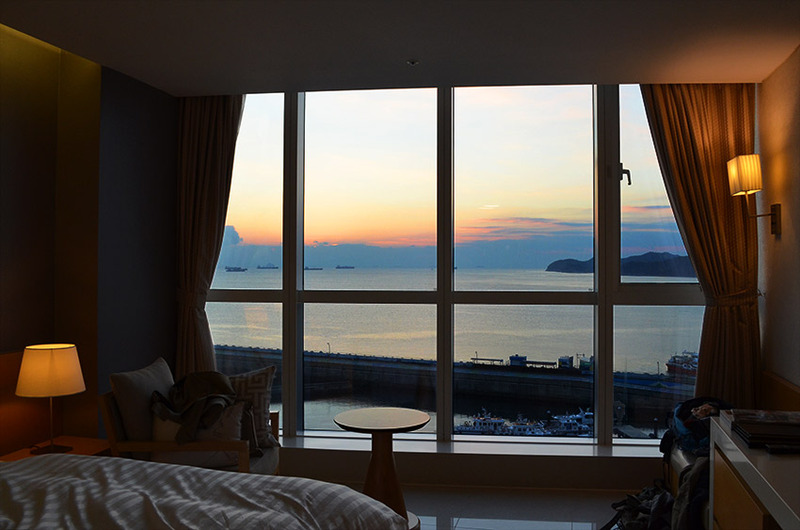 The rooms had gorgeous views of the bay. 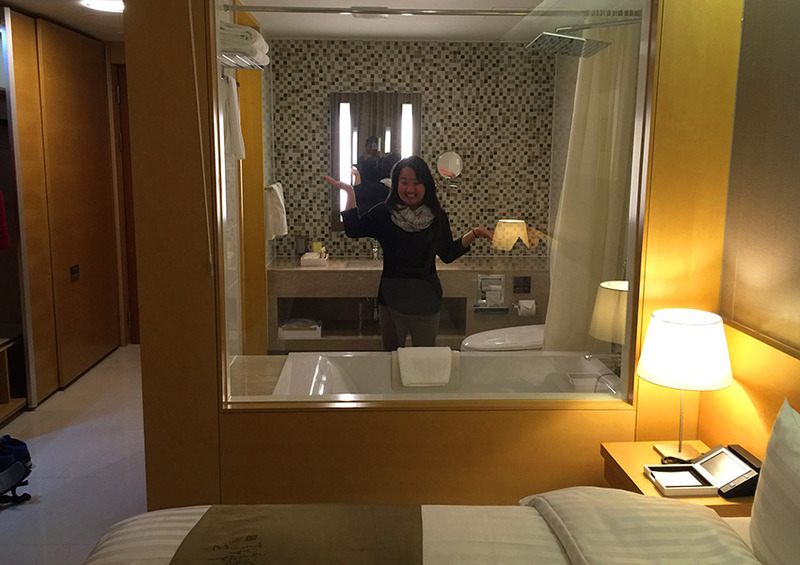 We thought one feature was funny… the bathroom had a curtain that opened like a window to the room. The purpose was so you could watch the sun rise and set as you bathe. 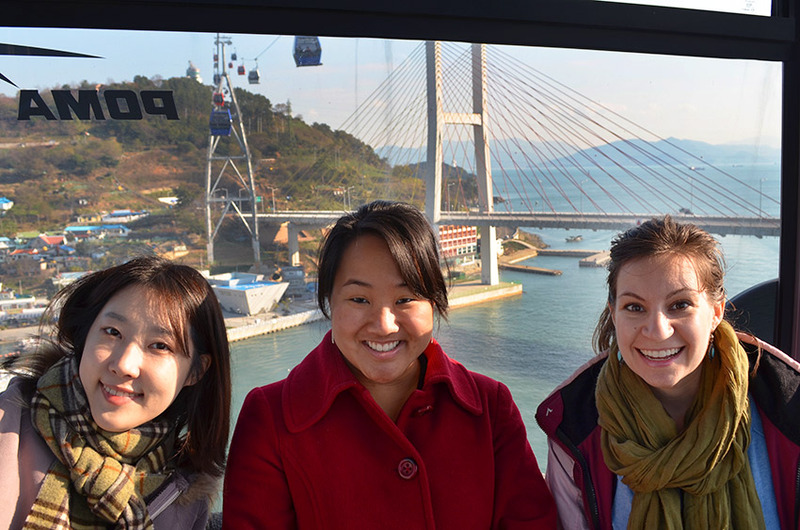 After checking out of the hotel, we loaded our bags on the bus and then walked to the Yeosu Maritime Cable Cars (여수 해상케이블카). 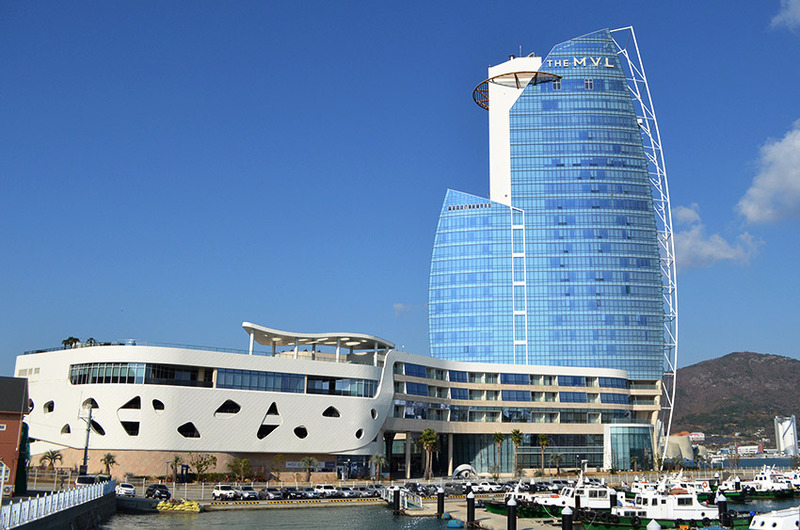 This attraction opened in December 2014. We rode in the special “crystal” cars that had glass bottoms. 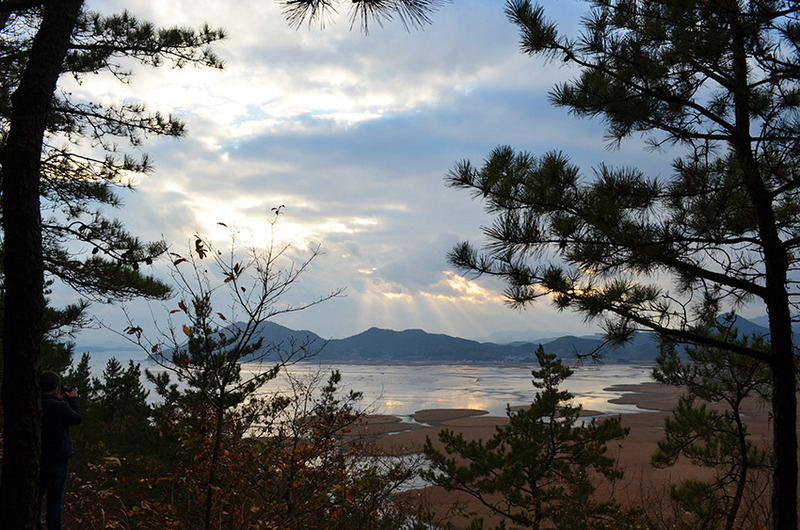 The views were beautiful as we traveled over the Dadohae Marine National Park and Dolsandaegyo Bridge. 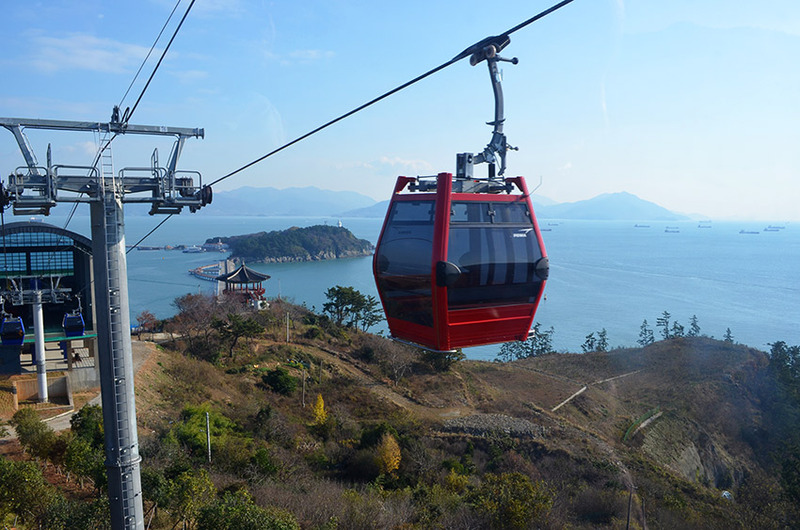 After our cable car rides, we walked to Odongdo Island (오동도). We had less than an hour there. 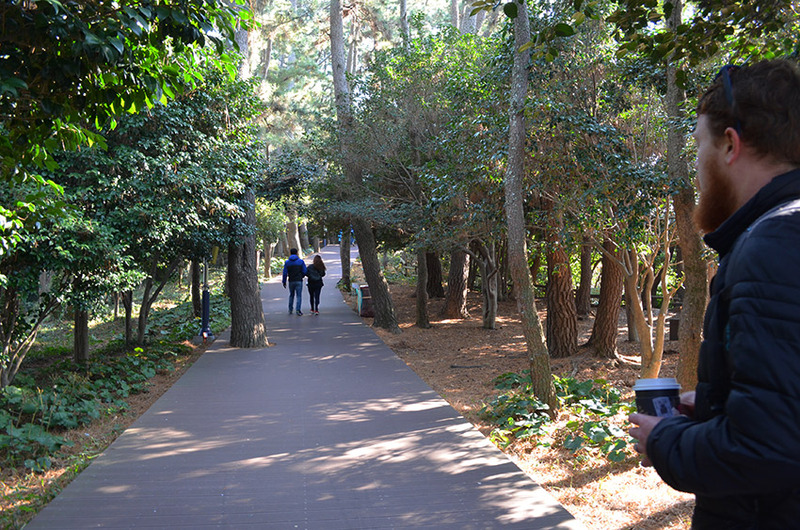 The weather was much warmer in Yeosu and the greenery was beautiful. After another huge lunch, we headed to the train station to return to Seoul. We had a wonderful time with our 23 friends! Thank you, KFS Foundation!!! 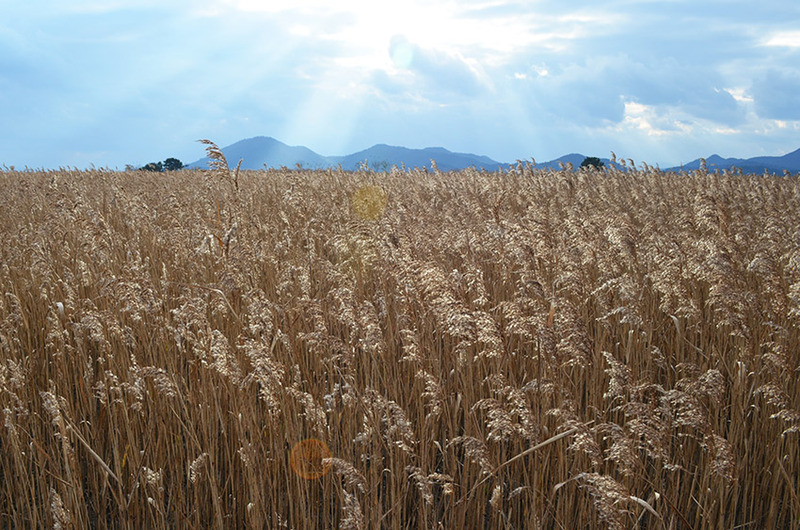 • For more information on the Suncheon area, visit www.suncheon.go.kr. 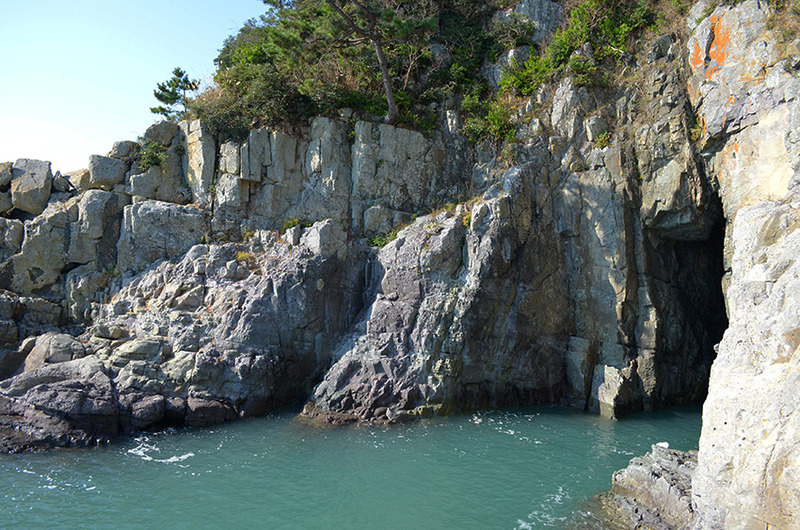 • For more information on the Yeosu area, visit www.ystour.kr/en/main.jsp.